According to the market research institute Gartner, Sony sold 37.6 million smartphones in the last year. This is not even a tenth of what the market leader Samsung sells every year. However, Sony usually benefits from its large company: May it be a special panel technology, which can be used from its own Smart TVs, a very clever camera lens from the camera department or the close relationship with the PlayStation, which can be found in many living rooms. Unfortunately, the realization is usually not as good as it could be. Let us see if Sony was able to improve the situation. The Xperia Z2 is the new flagship device designed to convince more customers to buy Sony smartphones. The latest version is already impressive because of its size: Although the diagonal size of the display is just 0.2 inches larger than the Samsung Galaxy S5 or the HTC One M8, the smartphone almost looks like a phablet at first. The technical foundation is similar to the Galaxy S5 and HTC One M8, so there will not be big differences in performance but rather in the sections Case, Camera, Software and Handling. Three new high-end smartphones are great for a comparison, so we will publish a related article soon. Besides the comparison with the Samsung Galaxy S5 and the HTC One M8, there is obviously the question how it fares against the predecessor Xperia Z1, which is not that old and currently around 200 Euros (~$273) cheaper than the Xperia Z2 on the Internet. 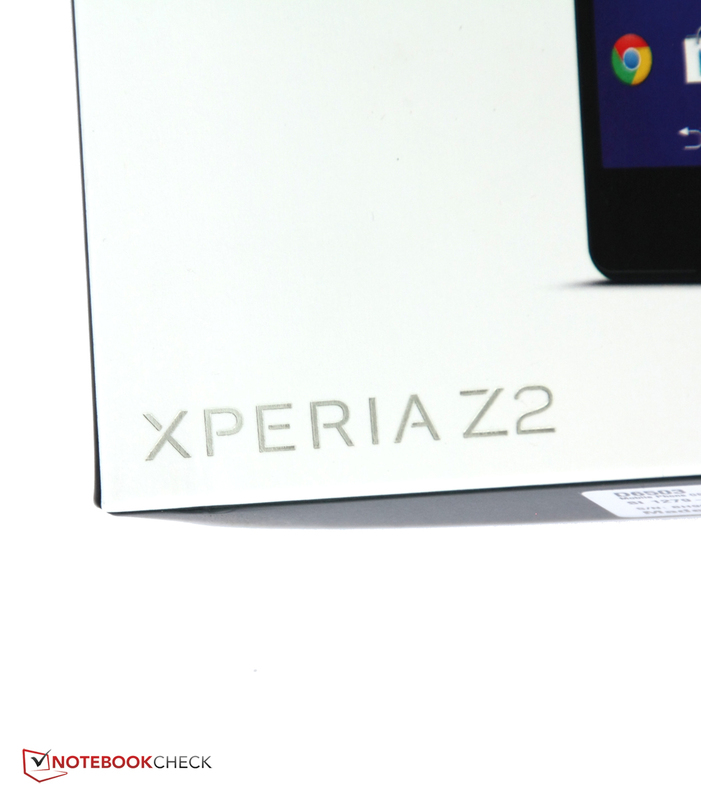 LG G2, Nokia Lumia 925, Google Nexus 5 and Apple iPhone 5s are the other competitors for the Xperia Z2 in the high-end segment. 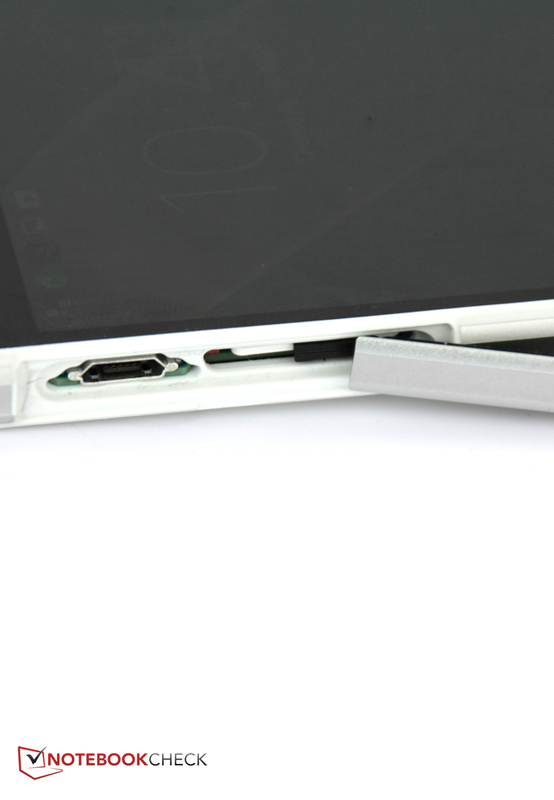 The Xperia Z2 can only be opened with tools (picture: Mobile China). The mineral glass back looks nice, but is also slippery. We already mentioned that the size is the most striking feature of the Sony Xperia Z2: The display size was increased by 0.2 inches compared to the Xperia Z1; the Xperia Z2 now has a 5.2-inch screen. However, the case only got longer by almost 3 millimeters, the width was actually reduced by 0.7 millimeters and the thickness reduced by 0.3 millimeters. So why does the Xperia Z2 look bulkier than other smartphones like the Galaxy S5 or the HTC One M8? 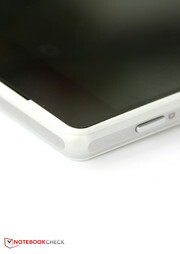 Probably it is just the boxy shape with just slightly rounded corners, whereas HTC and Samsung use rounder cases. 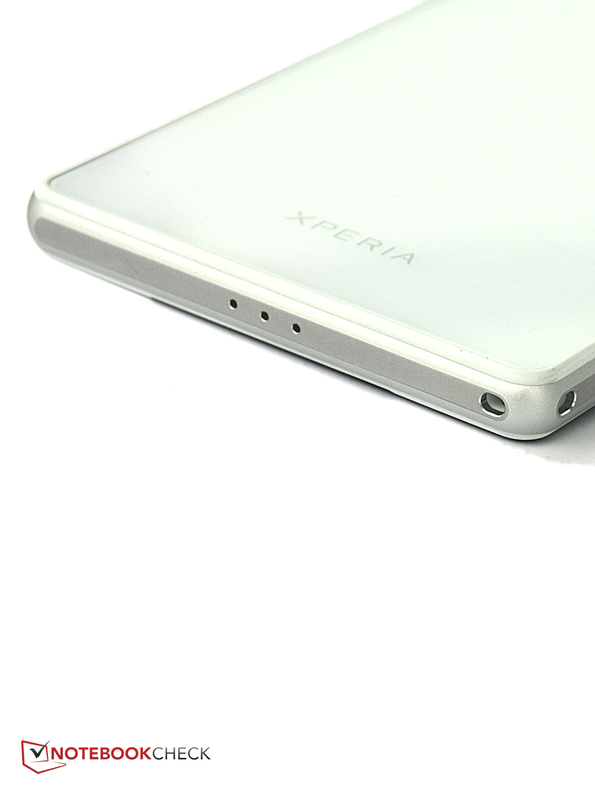 The Xperia Z2 is also a bit lighter than the Z1, but only by around 6 grams (~0.21 oz) and you will hardly notice it when you hold it. The lightest smartphone with a similar size and specifications is still the Samsung Galaxy S5, which is 18 grams (~0.64 oz) lighter than the Xperia Z2. 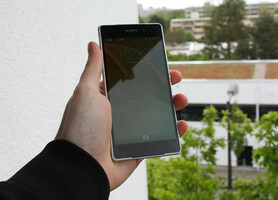 Still, Sony’s latest high-end smartphone does not feel very heavy; it is easy to grip and actually feels very good. A 5.2-inch smartphone is obviously not suited for small hands, but this is a problem of all current high-end smartphones – the solution would be the so-called Compact version. Apart from the slightly increased dimensions, we could not really find big differences compared to the predecessor in terms of design. The polished edges that are slightly rounded, the stereo jack with a chrome ring, the characteristic round power button in a retro design: Everything is well designed and leaves a high-quality impression. Available colors are a classic black, a dignified white and a funky purple. The differences are limited to the display frame and the back of the device. 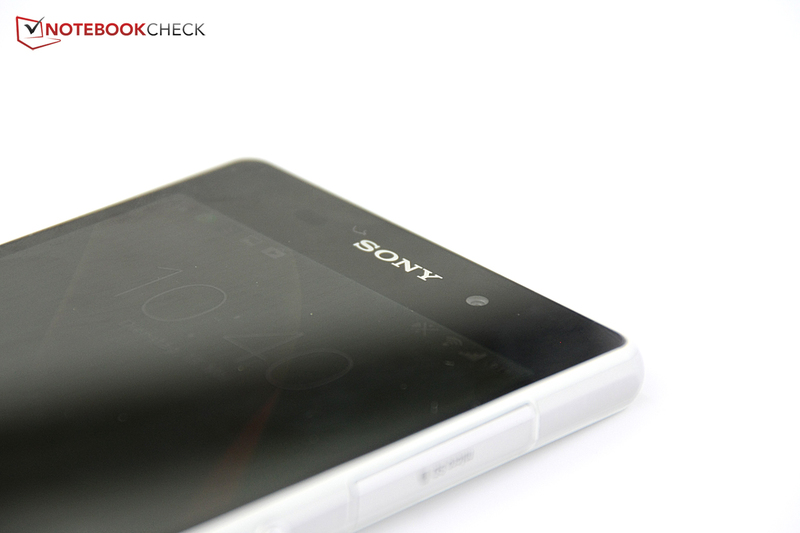 Sony’s Xperia Z2 is once again dust resistant and waterproof according to IP55 and IP58. 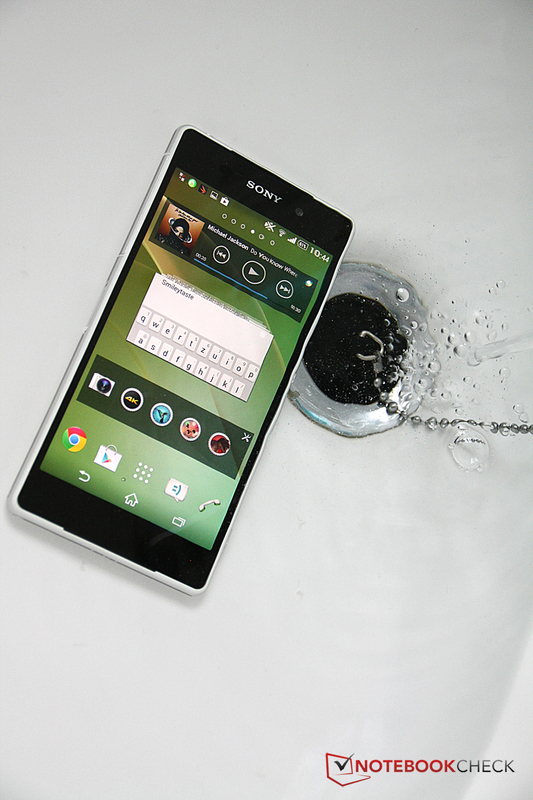 According to Sony, you can use the smartphone 1.5 meters (~4.9 feet) deep in fresh water for up to 30 minutes. Furthermore, the smartphone is protected against damaging amounts of dust. Samsung's Galaxy S5 is dust resistant and waterproof according to IP67, which means it is completely protected against dirt, but you cannot submerge it for such a long time. Mineral glass and aluminum are the dominant materials, which is similar to the predecessor. Sony’s latest smartphone, however, cannot keep up with the haptics of the HTC One M8, the boxy design just feels a bit bulkier. The glass back cover also easily attracts fingerprints and does not have the same good grip as the back of the Samsung Galaxy S5; it looks nice but is not as practical. 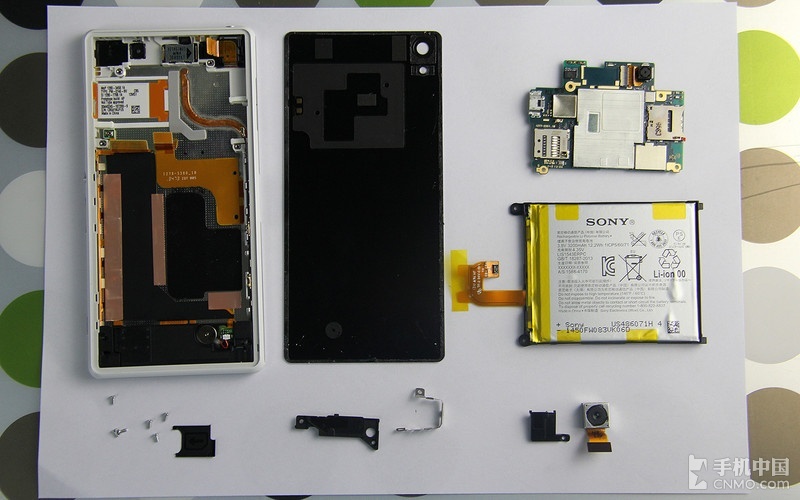 There is currently no teardown of the Sony Xperia Z2 or the predecessor from iFixit. 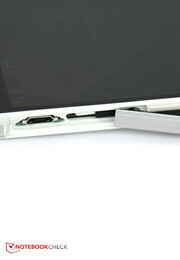 However, the Chinese colleagues from Mobile China have unassembled the smartphone. Despite the supposedly fragile mineral glass back cover, they say that the Xperia Z2 is pretty easy to open with the correct tools and you can easily access all the chips and the battery. The construction also looks simple on the picture, which should reduce the cost of a repair. However, within our comparison group, only the Samsung Galaxy S5 has a removable back cover and a replaceable battery. A USB 3.0 port, which can be found on the Samsung Galaxy S5, is not available on the Sony Xperia Z2, and the same applies for the Infrared sensor. Both the Galaxy S5 and the HTC One M8 can be used as a remote control for your TV. Other spectacular gimmicks like a heart rate monitor and fingerprint reader of the Samsung Galaxy S5 are not available, either. The smartphone has 16 GB internal storage, which can be expanded by up to 128 GB via a micro SD card. Sony also follows the fitness trend and integrates a step counter. On the left side is a magnetic connector for the optional docking station. Another noteworthy feature is the increased memory size: The Xperia Z2 has 3,072 MB RAM. However, this is a feature for the future since the 2,048 MB found in the rivals is usually sufficient for almost all scenarios. 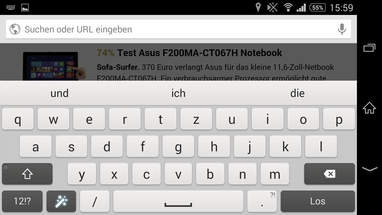 Especially when you consider that the Xperia Z2 does not support real multitasking, contrary to the Samsung Galaxy S5. All ports are hidden behind covers to ensure the dust and water resistance. 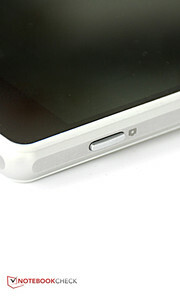 The covers can easily be opened and closed, but inserting the SIM card is rather tricky. The software supports multitasking with certain apps. 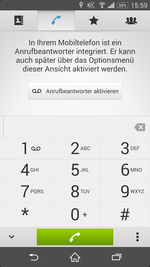 Sony's slightly customized Android version looks dignified and simple. 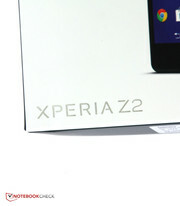 Sony is unfortunately not known for the integration of the latest operating systems. 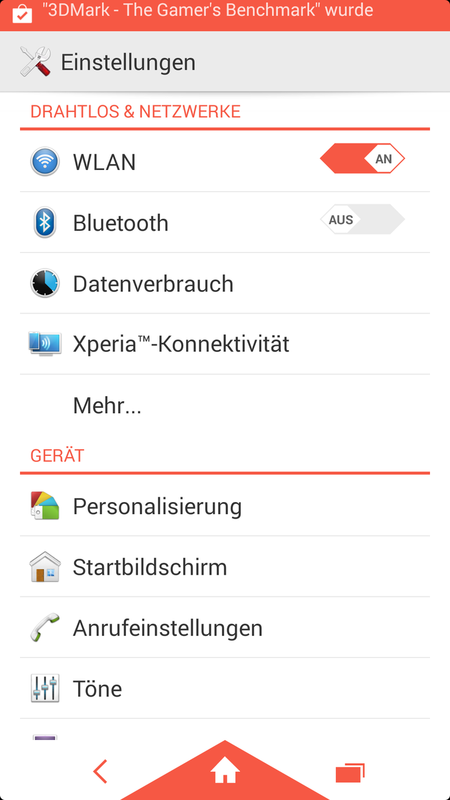 Sony's Xperia Z1 still used Android 4.2, but the Xperia Z2 uses Android 4.4. Sony also implements its own features, which is probably the main reason for the delays of the latest operating systems. The operating system was only adjusted in details and should not be a problem for Android veterans. However, newcomers should not have issues with the handling either. The performance is also great: We could not encounter dropped frames or delays. A download from the Google Play Store once hung up, but that could be fixed with a restart. 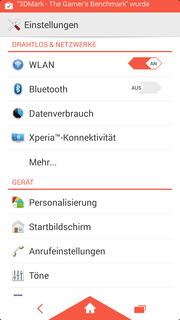 Sony’s own features are, for instance, Xperia Designs, which can be found in the menu Personalization. 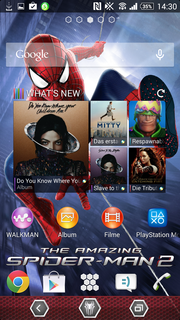 Here you can switch between dozens of downloadable themes that can change the Android design significantly, for example, a theme for the new Spider Man movie or for a Film Noir look. The themes are a nice change from the standard Android design. 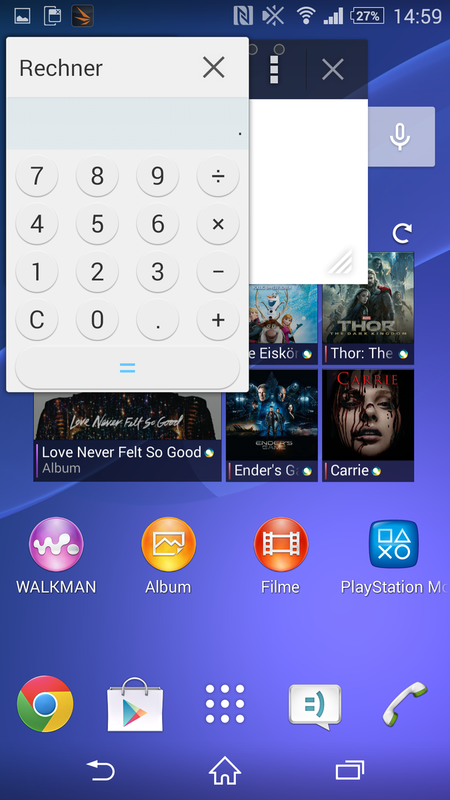 Links for the Sony apps are on the left side of the home screen, including Music (Walkman), Pictures (Album), Movies or PlayStation Mobile. You will be disappointed if you expect great free games, a PS Vita emulator or even an implementation of the streaming service GaiKai from the latter: It is basically just a mobile store where you can buy apps that are also available in Google’s Play Store. There is even another store called Sony Select, which offers the same apps. 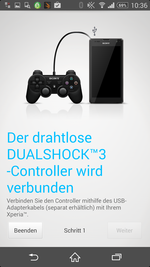 The only real highlight for gamers could be the support of the PlayStation 3 controller, although there are solutions for other Android smartphones as well. 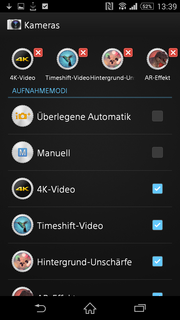 The apps for movies and Walkman on the other hand can convince us with a nice design and comprehensive features, and the advertisements for Video Unlimited are not too annoying. If you like Sony’s download services you can see all the new contents via applet on the home screen. HTC has BlinkFeed, Samsung Flipboard, but what about Sony? The news app, which includes social media feeds as well, is called Sociallife. The design is very nice, the handling simple, but the widgets are not as good as the two rivals. 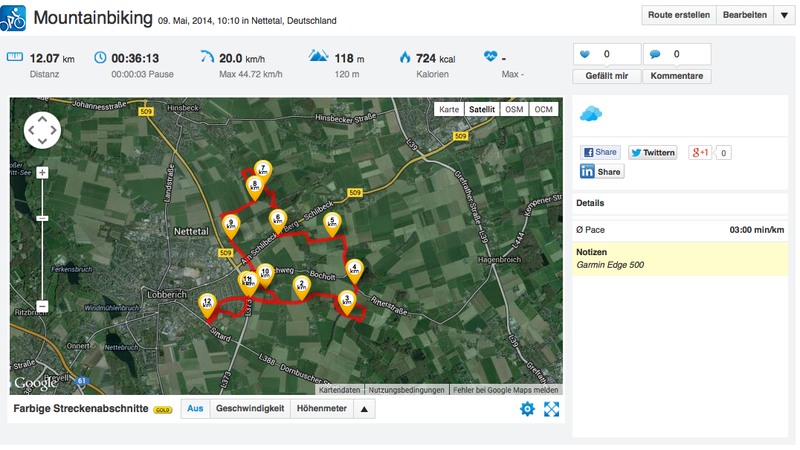 Wisepilot is a decent free navigation software, but you also get a trial version of Garmin’s navigation software. 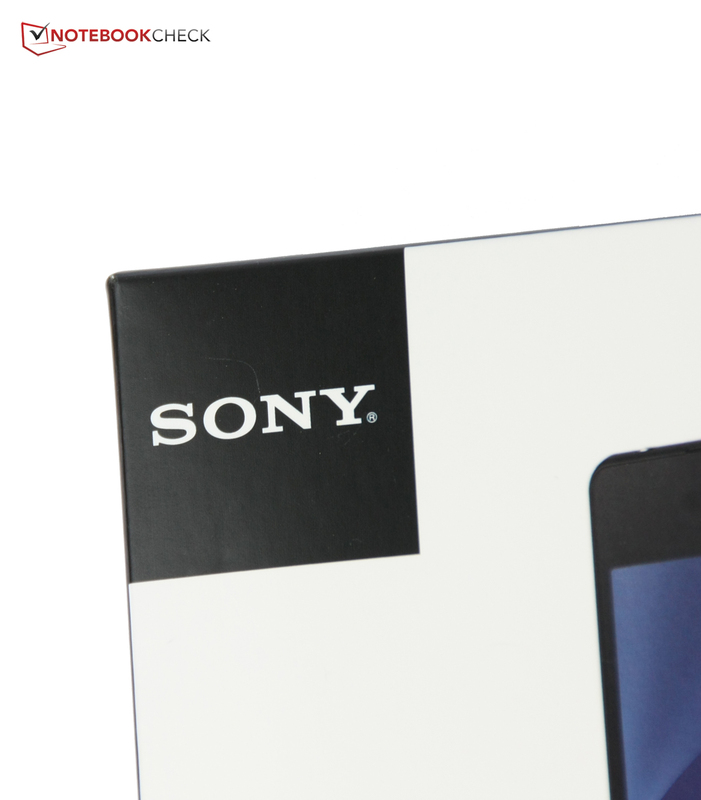 Furthermore, the purchase of the Xperia Z2 includes a couple of free movies from Video Unlimited. 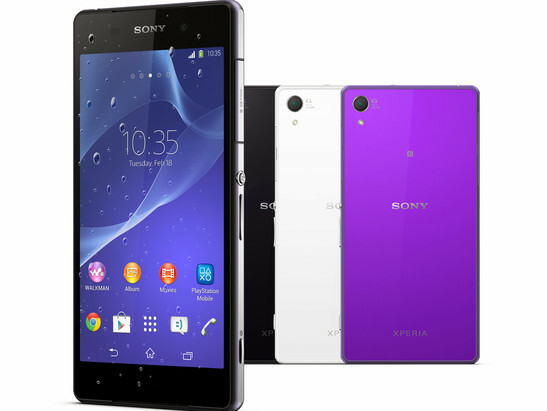 All in all, Sony equips the Xperia Z2 with a lot of features from the company. However, the results could have been much better: For example exclusive content for PlayStation owners who now own a Sony smartphone or a preloaded music library with content from Sony Music. Still, Sony includes some features that other smartphone manufacturers cannot offer. 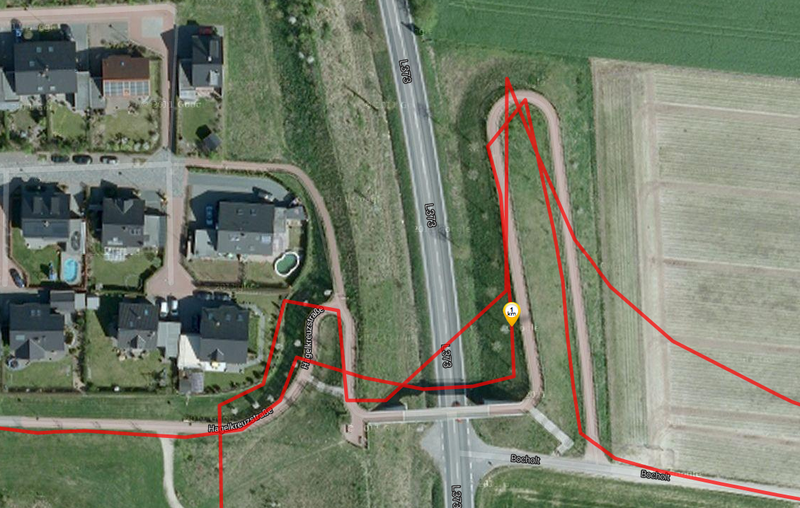 The GPS signal is not sufficient indoors. The position is quickly and precisely located outdoors. The communication features of the Xperia Z2 are on a very high level, which can be expected for a high-end smartphone: Four GPRS bands, five UMTS bands and ten LTE bands enable calls and web browsing in as many countries and networks as possible. We usually had a good signal in the average German E-Plus network, and the reception did not really fluctuate in our offices. The maximum transfer rates for LTE are 150 Mbps downstream and 50 Mbps upstream. 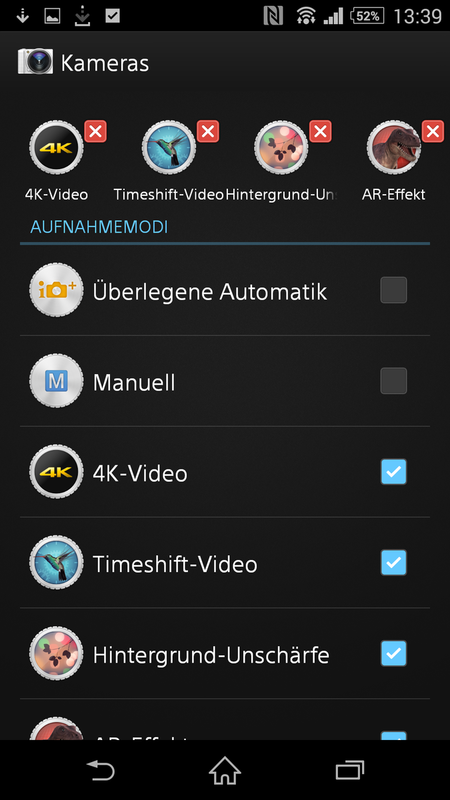 NFC and Bluetooth 4.0 are available, just like MHL or Miracast. WLAN according to the standards 802.11 a/b/g/n/ac enables theoretical transfer rates of up to 1 GBits/s. 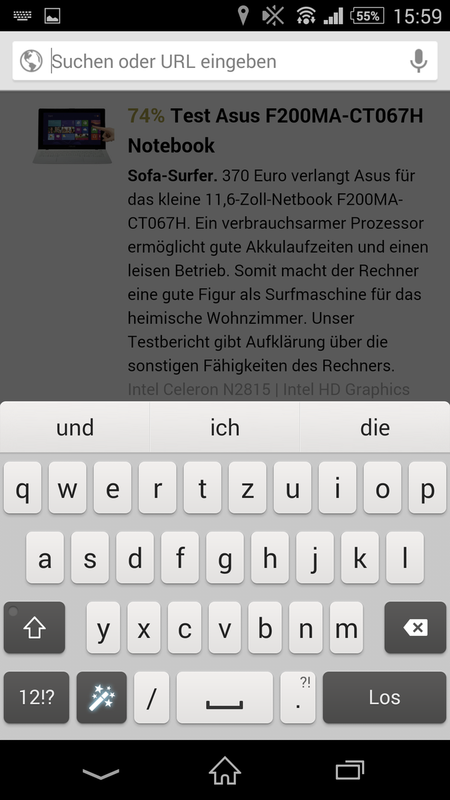 Sony’s Xperia Z2 obviously supports 2.4 as well as 5 GHz networks. The signal is good: We still had 3/4 of the signal with a distance of ten meters (~33 feet) from the router and through three walls. 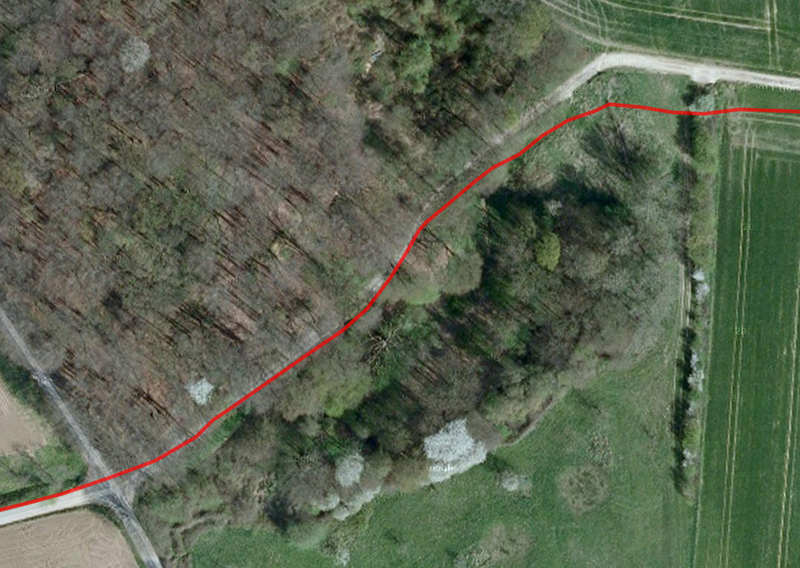 Five more meters (total ~49 feet) and another wall result in signal strength of 50%. Sony uses a combination of the American GPS and the Russian Glonass system to locate the position. Because of the increased number of satellites, the accuracy is even better. 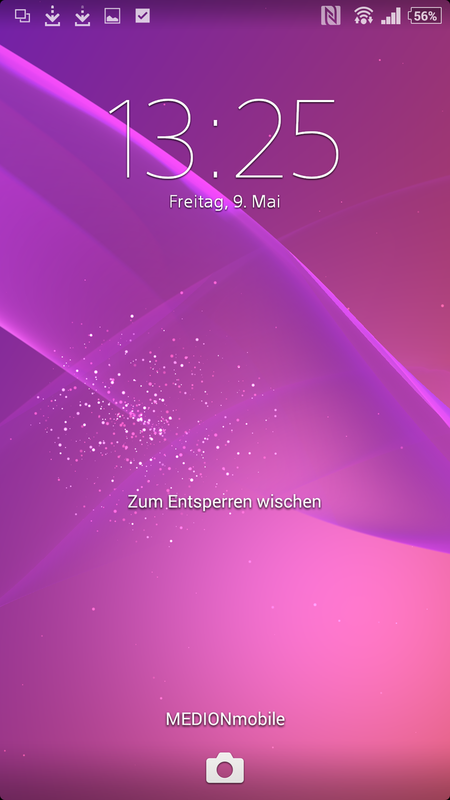 However, locating the position indoors is not a strength of the Xperia: The smartphone does not reach enough satellites for a location. It also takes a couple of seconds outdoors, but it is accurate down to three meters (~10 feet). 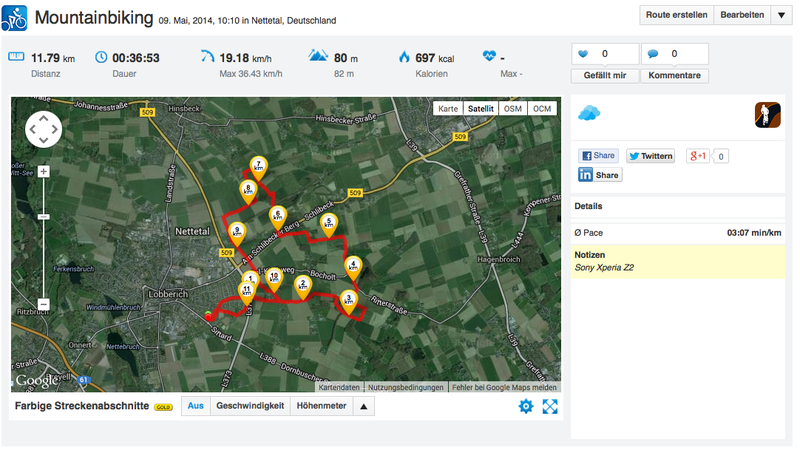 We determine the accuracy of the GPS signal with a bicycle ride, and we also took the professional navigation device Garmin Edge 500 for a comparison. 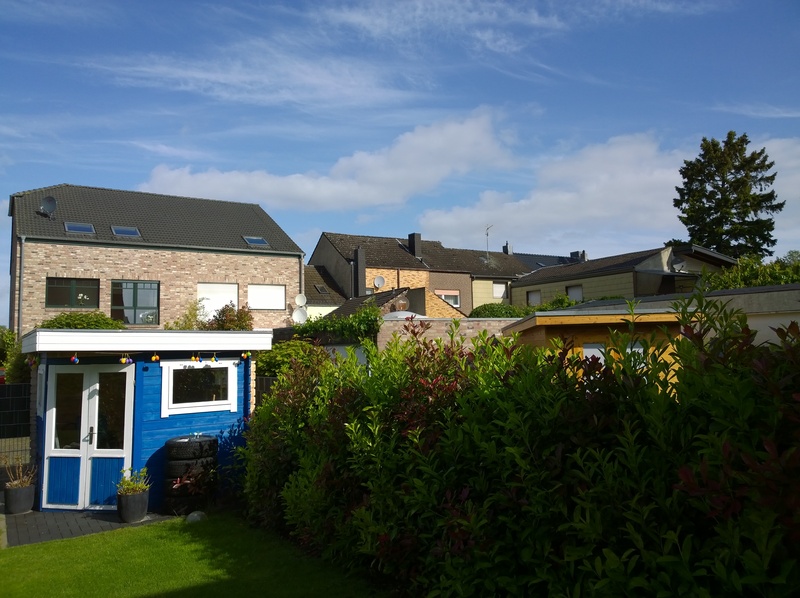 The Sony Xperia Z2 shows about 200 meters (~656 feet) less than the professional device, and the sensor has some issues at the bridge. 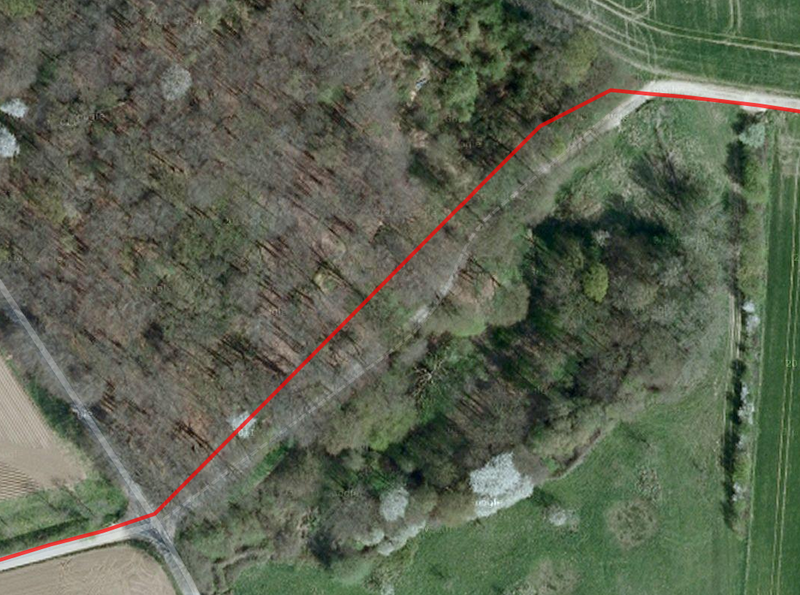 The track is also shifted in the forest. Overall, Sony could have done a better job, especially when you consider that navigation apps are becoming more popular for many customers. 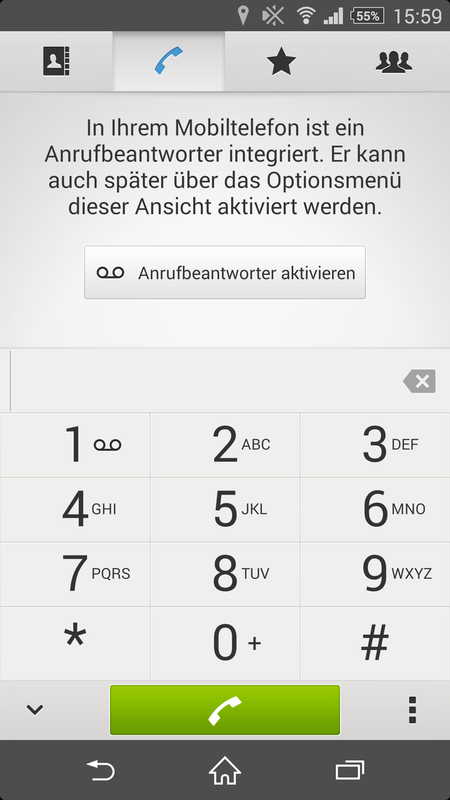 The phone app does not reveal any surprises: The standard app from Google is used. As usual, the handling is intuitive and simple. A small extra is an integrated answering machine, so you do not always have to call your mailbox and the calls are directly stored on the phone. However, you will have to record a message because there is no default message. 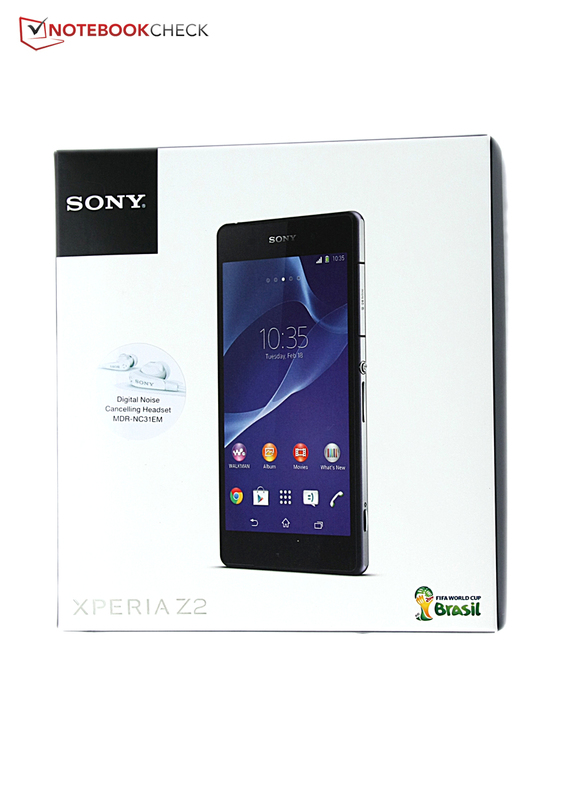 Take a call and you will quickly notice the excellent voice quality of the Sony Xperia Z2. The caller is very clear and sounds very natural. The maximum volume is also very high, but the nearby environment might hear the conversation as well. The voice also sounds good via speaker, although the quality of the hands-free feature cannot quite keep up with the HTC One M8. Our voice is also easy to understand. There are additional settings in the menu to improve the voice quality: The settings for the equalizer of the voice did not really change anything, but the Voice Optimization actually improved the quality and the voice sounded richer. If you have problems with hearing or fast talking friends, you can also slow down the other person, so that he or she is easier to understand. All in all, Sony offers a great voice quality that can be adjusted to your personal preferences with numerous settings. Sony used several resources from its own departments for the camera, since they build high-quality compact and system cameras. 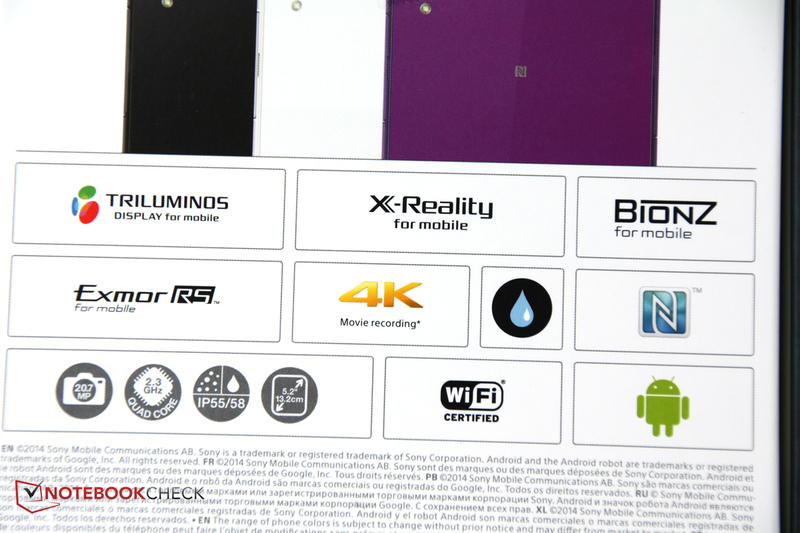 You will also recognize many Sony brands: Exmor RS and BIONZ for example; the former describes the sensor, the latter the picture processor, which is supposed to take very good pictures in bad lighting situations. Not a lot changed compared to the predecessor: The sensor is still the same, but that is not a bad thing by any means: The 20.7 MP camera uses a 1/2.3-inch sensor, which corresponds with a diameter of approximately 7.7 millimeters. The sensor is therefore significantly larger than most other smartphone cameras; this sensor size is also used by many compact cameras. The sensor of the Samsung Galaxy S5, for instance, is significantly smaller with 1/2.6-inch (around 6.2 millimeters in diameter). In combination with the BIONZ picture processor you get very good pictures. 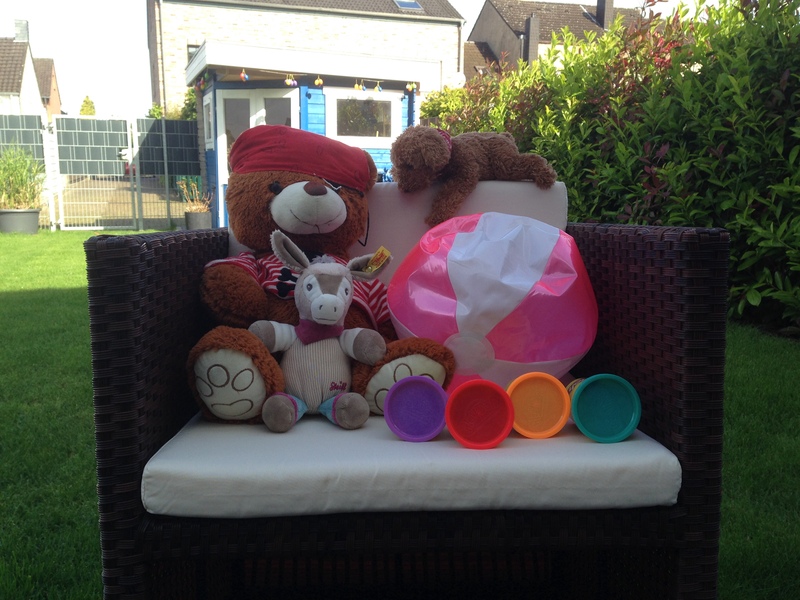 We think that the Xperia Z1 usually took the best pictures within the competition in good lighting conditions. However, the next generation is available with the HTC One M8 and Galaxy S5. Nokia's Lumia 920 was also better in low-light situations. 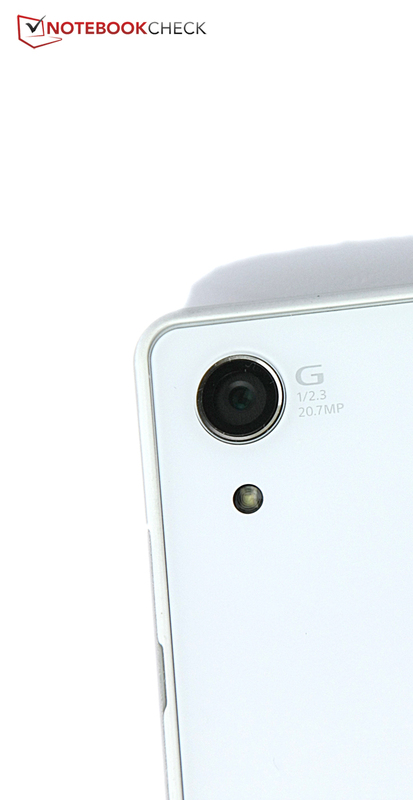 Attention: The standard app of the Xperia Z2 takes pictures with a resolution of 8 MP; the full resolution is only available in the manual mode or with other apps. 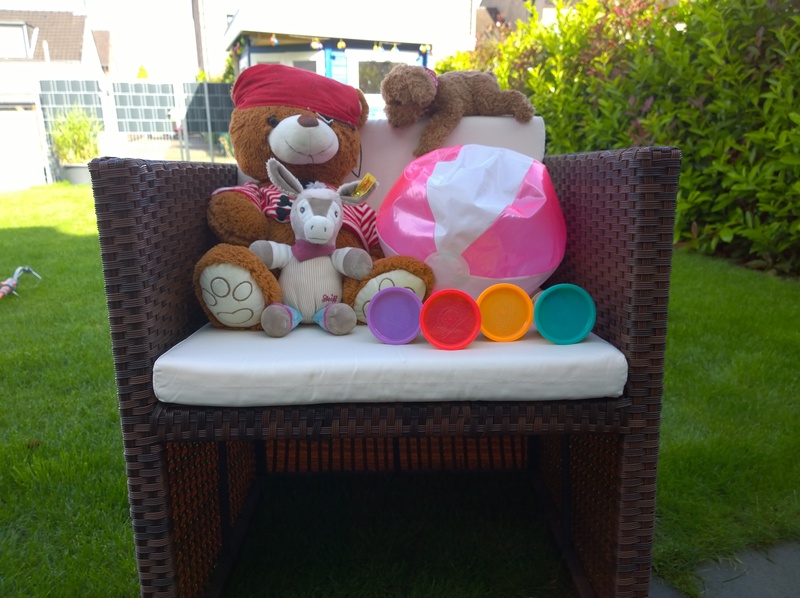 The Xperia Z2 takes excellent pictures in good lighting conditions that do not have to hide behind the excellent camera smartphone Nokia Lumia 1020. They obviously cannot compete with the system camera, but you can see many details, the edges are not frayed when you zoom in and colors look natural and bright, but not exaggerated. The sharpness is also okay. The Xperia Z2 is on the same level with the Samsung Galaxy S5 and the HTC One M8 in low-light situations: Edges are not as exact when you zoom in and you can see slight color noise. The camera still takes decent pictures in bad lighting conditions. 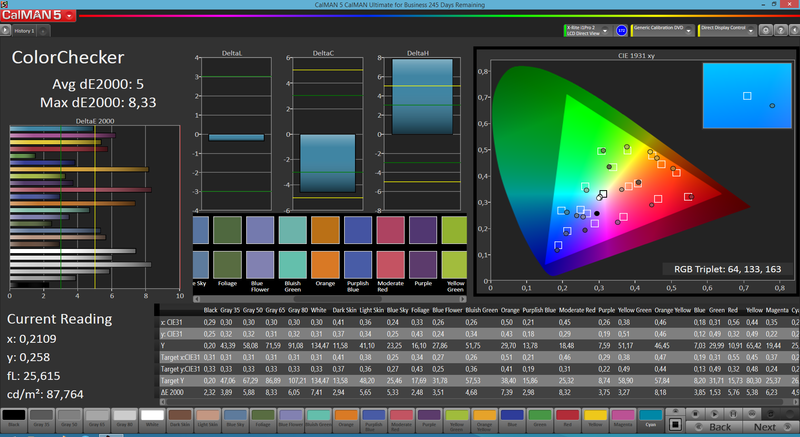 By the way, all devices fall behind the current Nokia cameras in terms of low-light performance. The software did not change very much, either, but Sony added some features to keep up with the Galaxy S5 and HTC One M8. You can add, for example, an almost mandatory blur effect for the background. This works pretty well because you select the effect before you take the picture: The camera takes two pictures with a different sharpness and uses them to calculate the blurry background. Afterwards you can change the intensity of the effect. 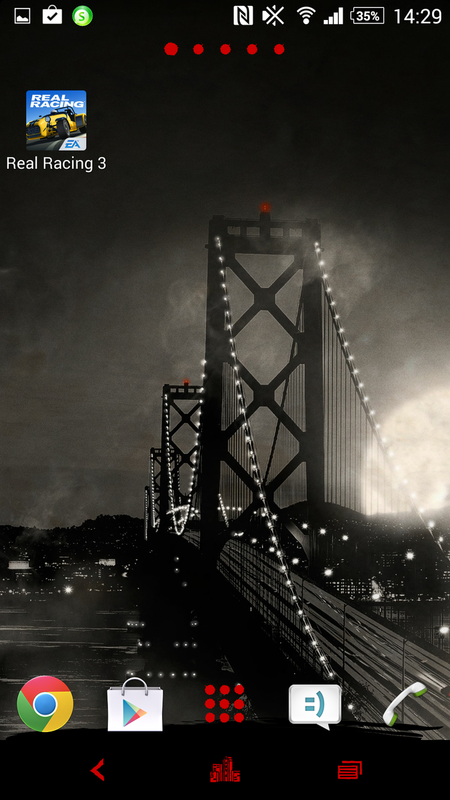 You can also use AR effects to let dinosaurs walk through the picture, take panoramas or get additional information for pictures you took, for example of buildings. Sony also put a lot of work into video recordings, and you can obviously record 4K videos. 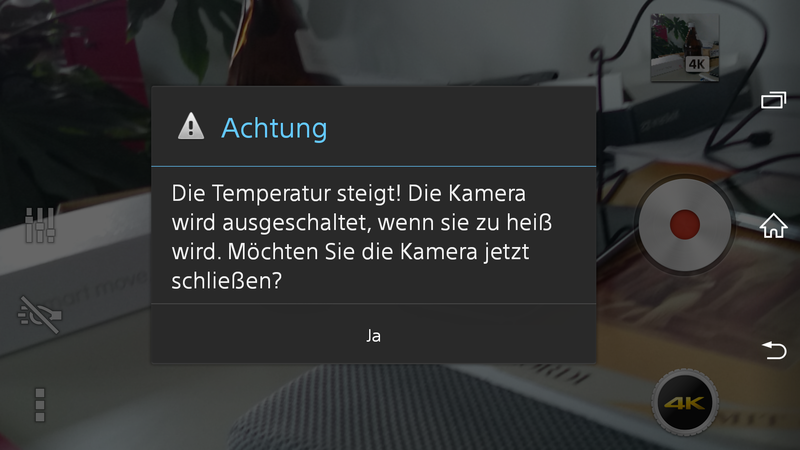 There is information on the Internet that the Xperia Z2 gets very hot when you record in 4K and that the device even shuts down after a while. The device actually gets warm after three minutes, five minutes later we got a temperature warning and the camera was deactivated. You can also record slow-motion videos, which works well, but you should notice that the sound is also slowed down. Besides free apps, movies and the new album from Michael Jackson, you actually get a high-quality headset, which retails for 59 Euros (~$81) in the Sony Store. The highlight: It supports a so-called noise canceling technology and filters ambient noise to provide undisturbed calls and music playback. This actually works quite well: You cannot hear a lot from the noise in the subway. Also interesting: If you want to use 4K video recordings for a short movie or make an interview, you can make high-quality voice recordings with the appropriate stereo microphone. 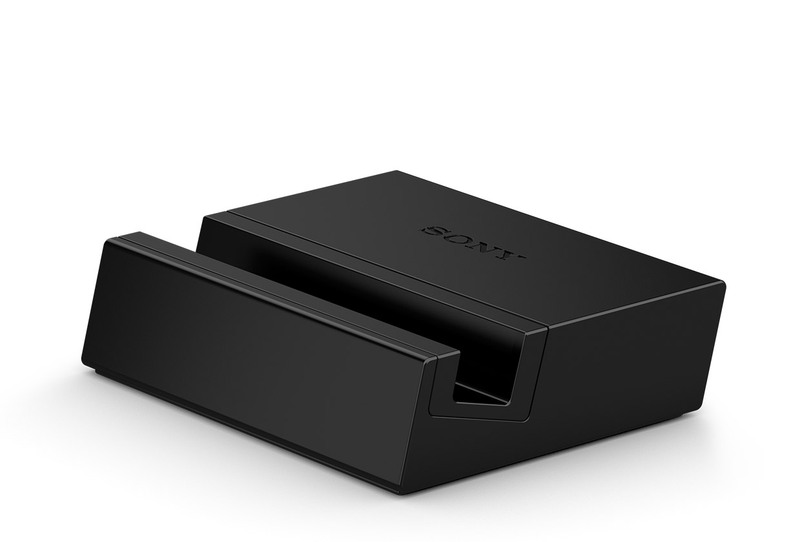 Sony charges 39.90 Euros (~$55) for this accessory. The docking station does not really do anything but charge the battery, Sony could have integrated audio ports or a speaker. 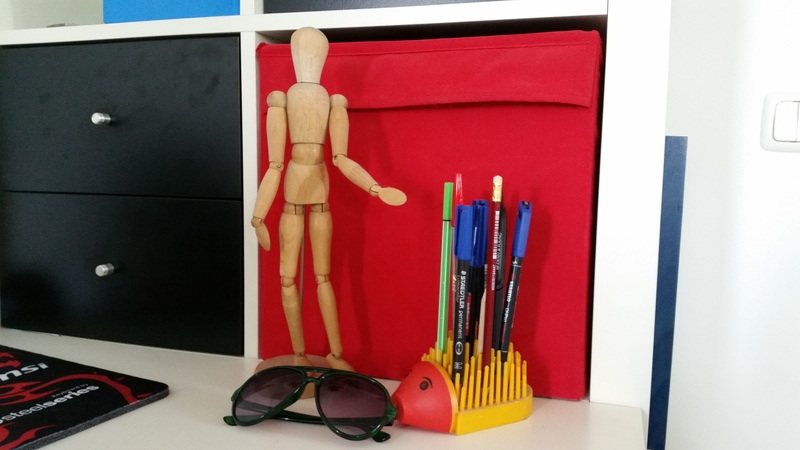 39 Euros (~$53) is the price, the cover with the handy stand is available for 29 Euros (~$40). The docking station only helps to charge the phone. The cover with the stand is available for 29 Euros. The stereo microphone is interesting for filmmaker and interviewer. 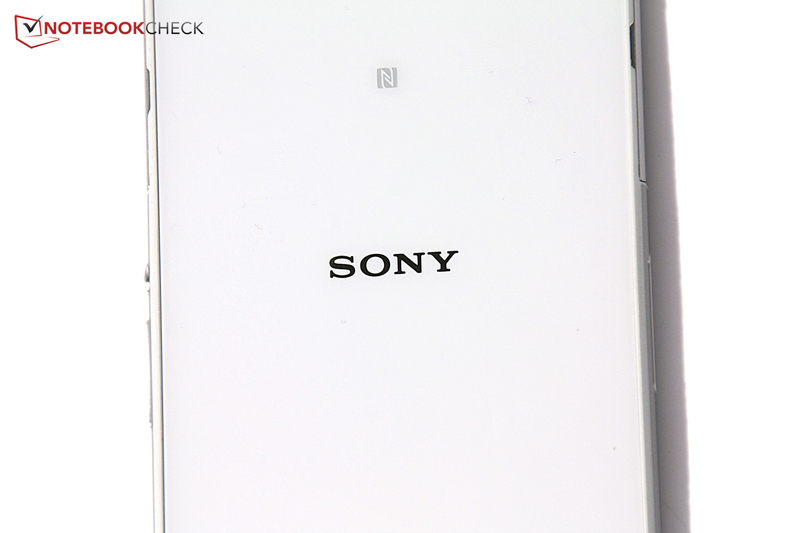 Sony grants a warranty of 24 months for its smartphones. In case of a repair, you can send the smartphone to the manufacturer. The capacitive touchscreen of the Xperia Z2 supports up to ten fingers simultaneously and offers a very sensitive mode as well, where you can operate the smartphone with gloves. This works pretty well with thin gloves, but gloves for skiing are too thick for inputs. There are only virtual touch buttons on the display and they reduce the available screen size in many situations. However, Sony uses a 5.2-inch screen, so you basically have a 5-inch panel without the touch buttons. The physical keys are located on the right side of the case if you hold the smartphone in portrait mode. You can find the power button, volume rocker and a physical camera button. All buttons leave a high-quality impression, the volume rocker is a bit small but it is still easy to use. 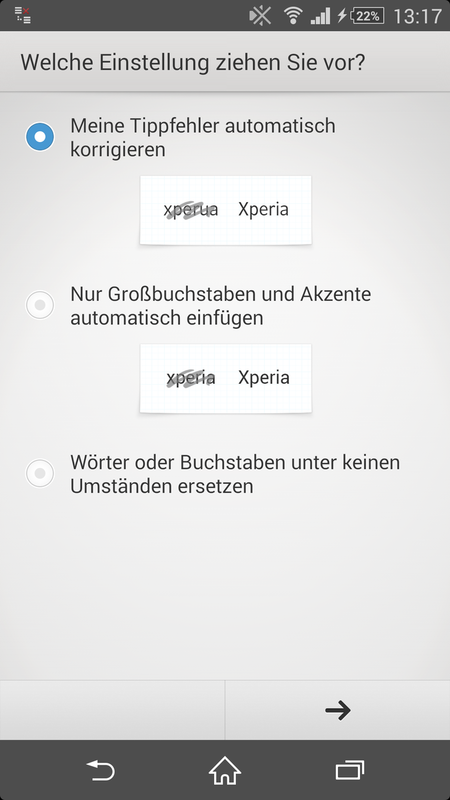 Sony uses its own Xperia Keyboard, which can be adjusted to your personal preferences with the wand at the lower left corner: Point and comma can be hidden, you can insert your own smiley button and the automatic correction can be adjusted. Typing or swiping over the keyboard can be used for inputs, and there is a dictate feature. Pretty much the only thing that is missing is the hand writing recognition. Otherwise, we really like the customizable keyboard: Purists get a simple keyboard, friends of fast typing can create shortcuts for many symbols. 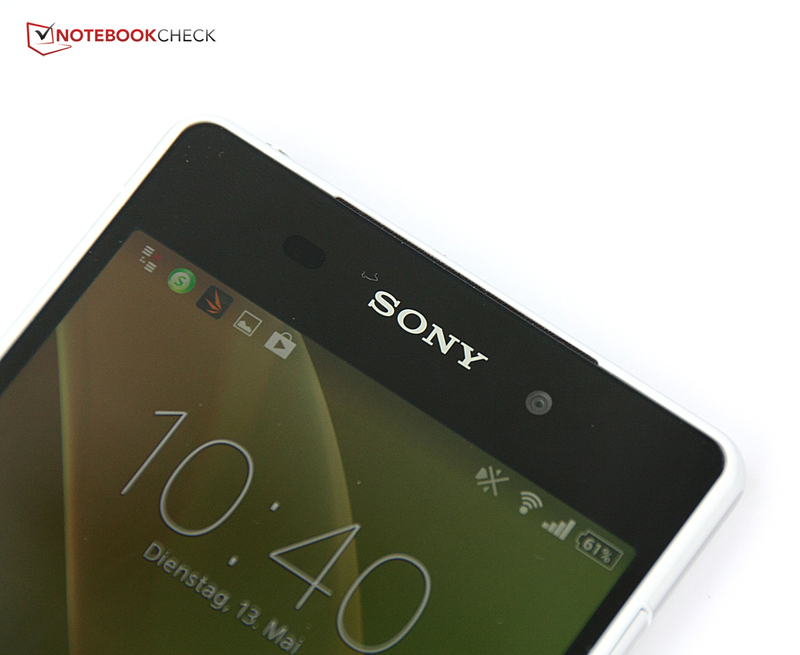 One criticism of the Xperia Z1's display was the high black value and the average viewing angle stability. 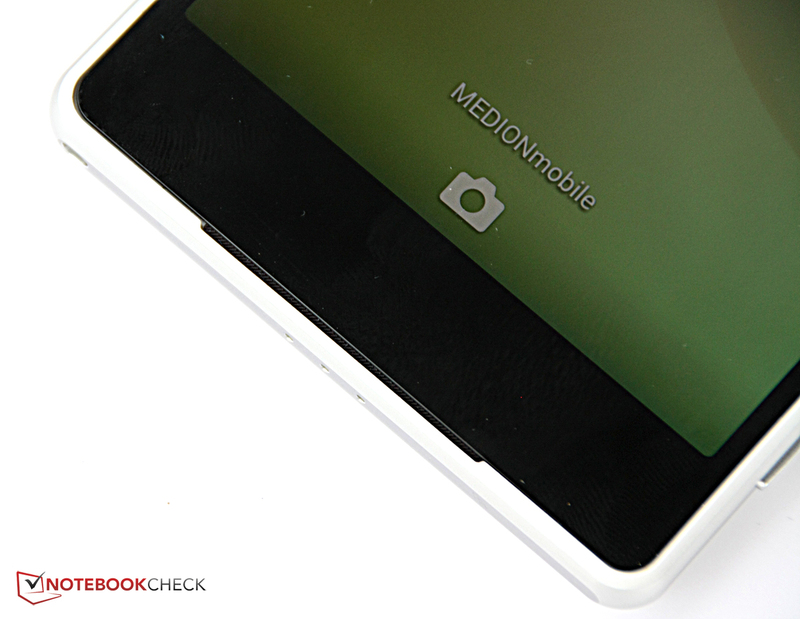 The Japanese were able to improve the situation in the Xperia Z2. 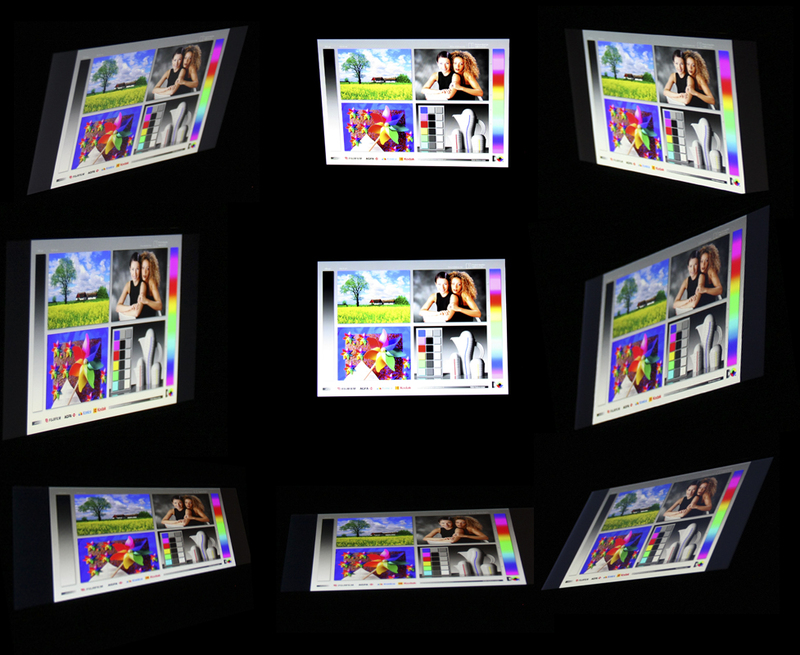 The display still uses Sony’s Triluminos technology with the same 1920x1080 resolution. Because of the larger 5.2-inch display, the pixel density is slightly reduced to 423.6 ppi. Subjectively, the panel still looks very sharp and the colors are vivid. The average brightness on the other hand is reduced by around 40 cd/m² compared to the predecessor and is now at 456.3 cd/m². This is still a good result within the competition, but the HTC One M8 and iPhone 5s are brighter. 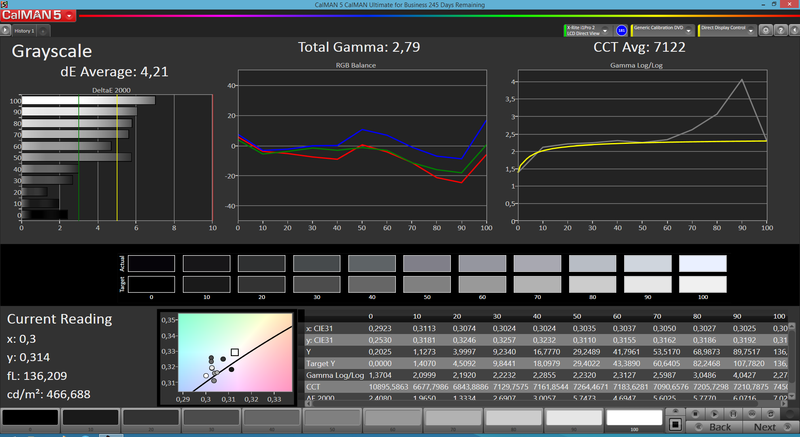 The black value is slightly better than the predecessor’s is, but still not great at 0.7 cd/m². 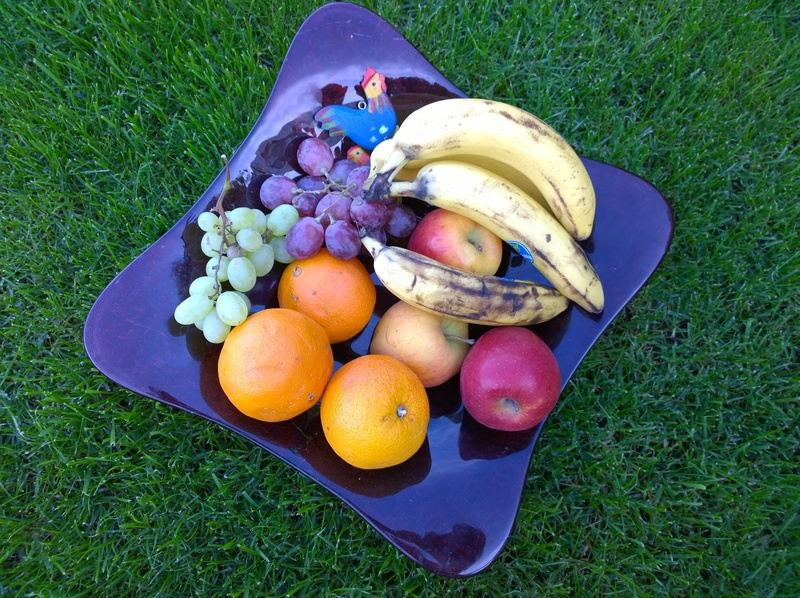 A contrast of 657:1 is only enough for last place in our competition, apart from the Xperia Z1. 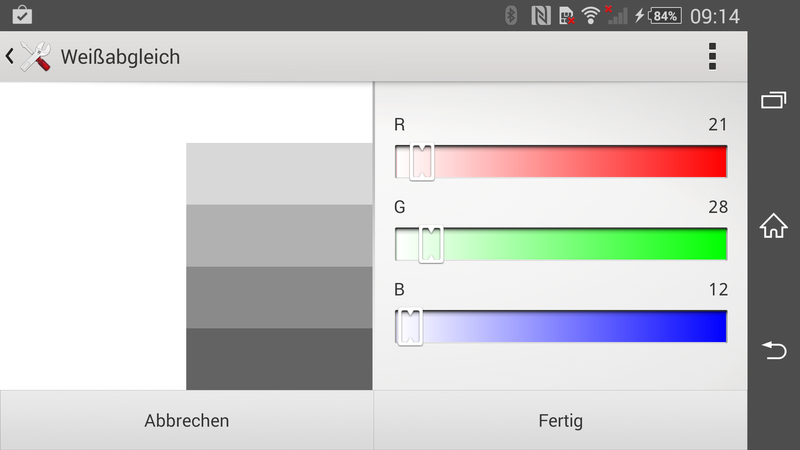 You can actually see the backlight from black areas, but colors appear richer and better differentiated compared to the display of the HTC One M8, which has the higher contrast ratio. 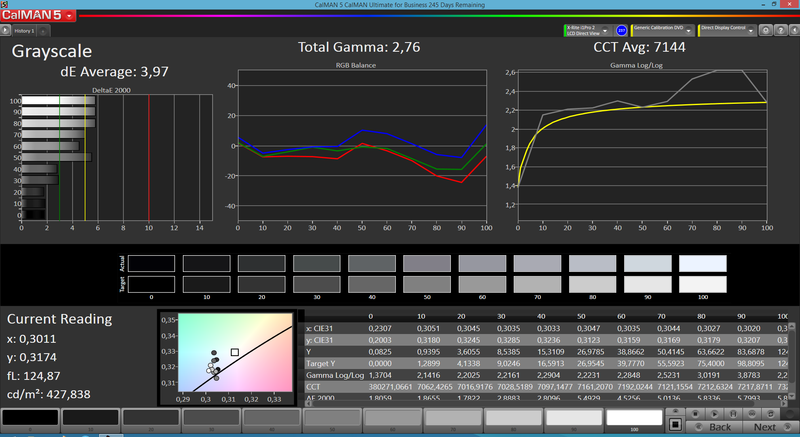 We continue our display measurements with a colorimeter and the software CalMAN. 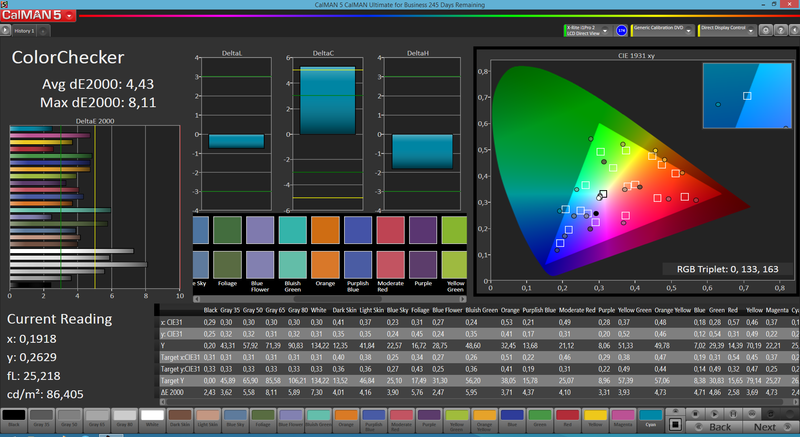 We can determine the color accuracy, for instance, compared to the reference color spaces sRGB or AdobeRGB. The panel can convince us with low DeltaE deviations. While darker colors are fairly accurate, we can see higher deviations for brighter shades of gray and they show a slight blue cast, which cannot be compensated by the strong under-saturation of the blue colors. 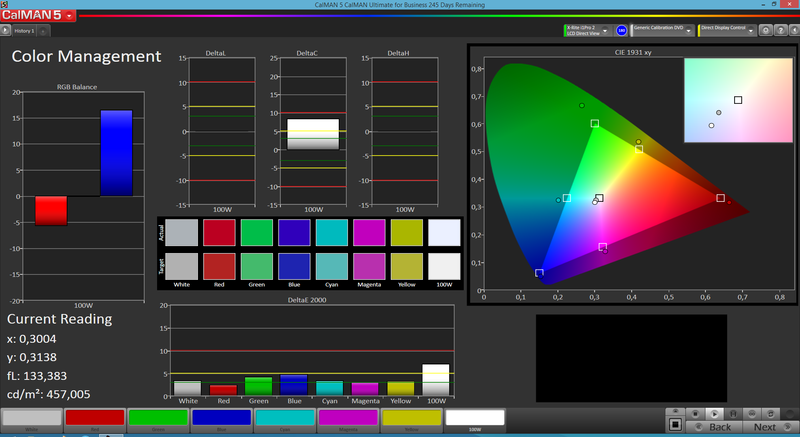 Fortunately, Sony offers a setting for a manual white balance of the panel, which can optimize the colors even further. The glossy surface is obviously annoying if you want to use your smartphone outdoors, but you can hardly avoid that issue at the moment. Apart from that, the Xperia Z2 is roughly on the same level with the HTC One M8, when you use it under the sun, despite the supposedly lower contrast. 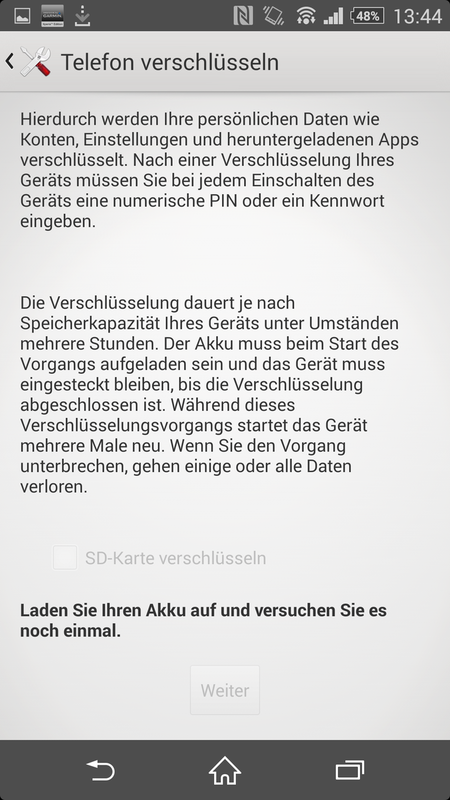 The readability of the Samsung Galaxy S5 with its infinite contrast on the other hand cannot be reached. The viewing angles were a problem of the predecessor, and the Xperia Z2 is not perfect, either: Despite the IPS technology, we can see a gray film, especially when you tilt the smartphone to the side. 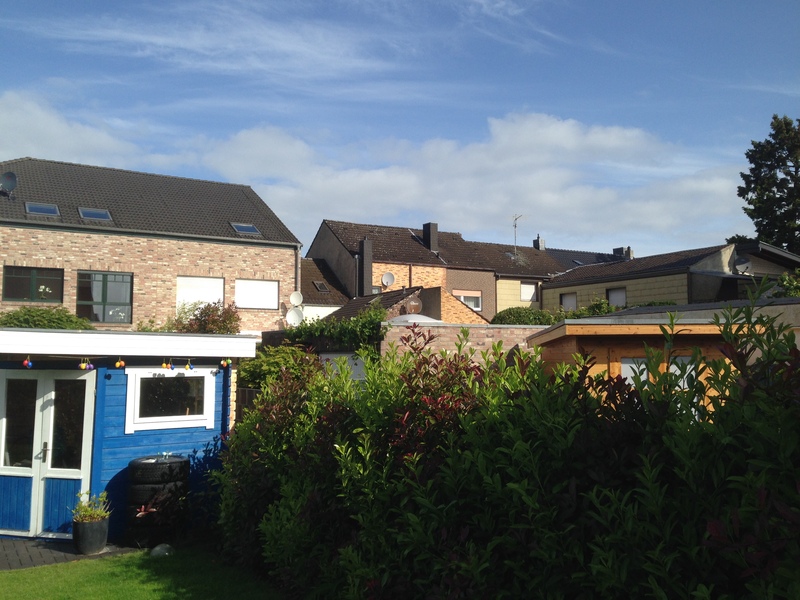 It is not as bad as the predecessor, but still visible. It is not very surprising that the Xperia Z2 uses an SoC from Qualcomm’s Snapdragon 801 generation, just like the Samsung Galaxy S5 and the HTC One M8. The Qualcomm Snapdragon 801 MSM8974AB runs at 2.36 GHz, which is just slightly higher compared to the SoC inside the Xperia Z1 (2.15 GHz), but it is more efficient and supports fast storage. The benchmarks hardly indicate a performance advantage over the predecessor, and the HTC One M8 is roughly on the same level in terms of processor and system performance. The Samsung Galaxy S5 has an advantage of up to 29% in some benchmarks, but the overall difference is not huge. The Sony Xperia Z2 is smooth in practice; even the integrated multitasking with certain features did not result in delays. All the tested apps also launched quickly and ran smoothly. With the experiences of the HTC One M8 that cheated in benchmarks, we installed the benchmarks 3DMark and AnTuTu 4 for the Xperia Z2 from unknown .apk files. The results were fortunately similar to the benchmark results from the Play Store apps. This means there are no benchmark manipulations by Sony. The graphics card Adreno 330 is similar to the predecessor, but the clock is slightly higher: 578 MHz compared to 450 MHz of the Xperia Z1. 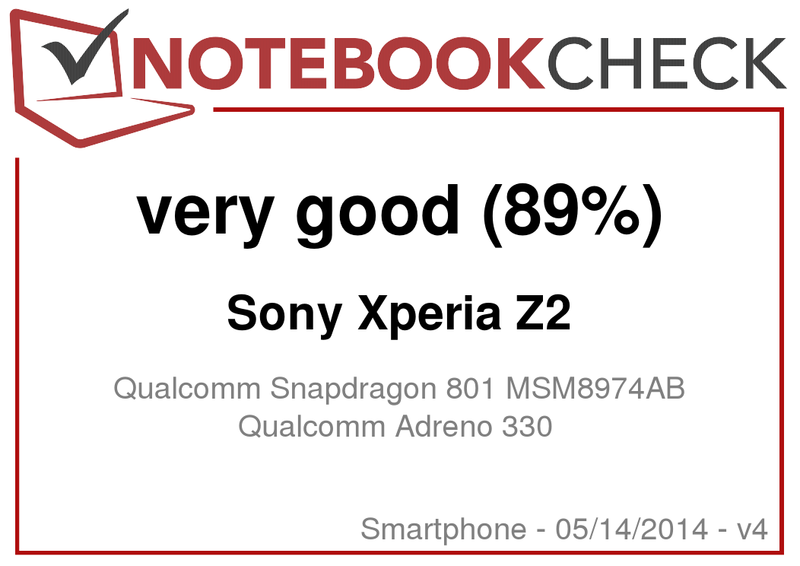 That does not increase all benchmark results, but the Xperia Z2 has a small advantage of around 5 to 10 percent in general. 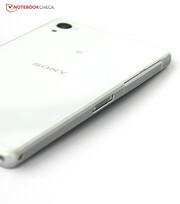 The Xperia Z1 with Chrome 30 was a very fast smartphone for web browsing. We determine the results for the Xperia Z2 with Chrome 34: They are comparable, but a bit lower. Compared to the current rivals One M8 and Galaxy S5 it is a neck-and-neck race between the competitors, none of the three rivals can claim the victory. 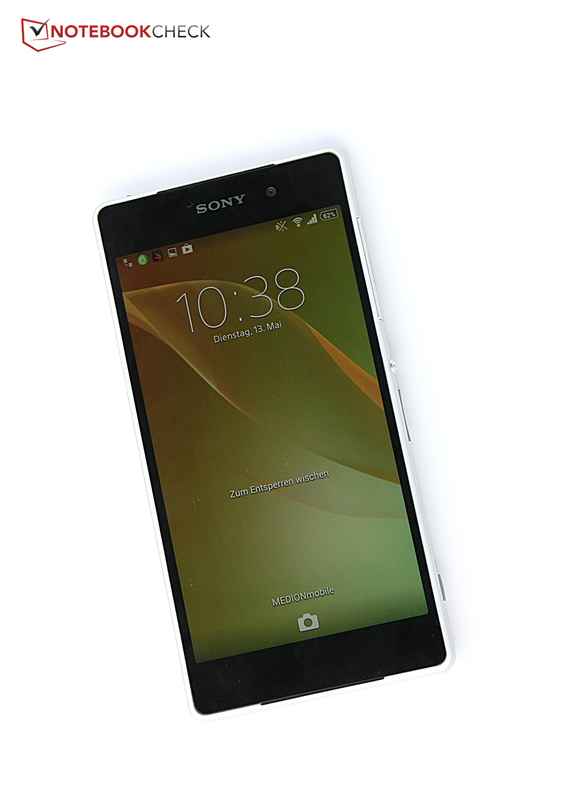 This means web browsing with the Xperia Z2 is fast in practice, websites are quickly opened and the navigation is smooth. Even complex HTML5 effects do not bring the smartphone to its limits. 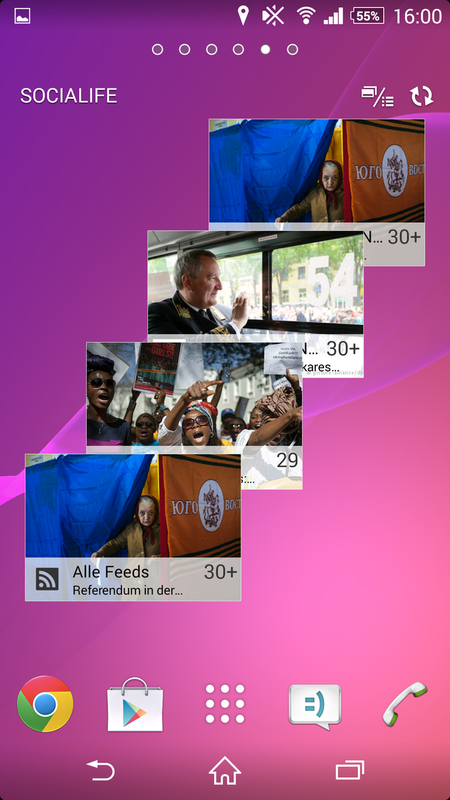 The storage of the Xperia Z1 was impressive, it is still significantly faster than the rivals except for sequential reads. 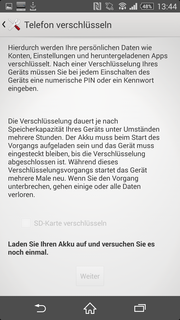 The Xperia Z2 uses slightly slower storage chips, but still beats all rivals with random read and write accesses. Short loading times are guaranteed in practice. The Xperia Z2 can be coupled with the PlayStation controller, but the process is complex. 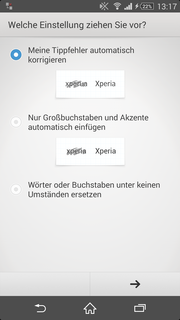 We already mentioned that the Xperia Z2 should not have any problems with complex games. After all, the device uses one of the fastest mobile GPUs currently available: the Adreno 330. 3D games like Real Racing 3 or Iron Man 3 are actually no problem for the graphics card. All the reviewed games on the Xperia Z2 also convince us with short loading times and completely smooth gameplay. You can control games with the precise touchscreen or the position sensor, which is reliable and quick as well. You can also connect a PlayStation controller if you do not like this input method. Did Sony create a great gaming experience? The manufacturer does not really advertise this feature, which suggests that it is not strictly mature yet: First, you have to connect the controller and the Xperia Z2 with a USB cable – and who has a cable with two micro USB connectors? This means you will have to get a USB-on-the-go adaptor. Developers also have to integrate the support for a gamepad. Some games that support the controller are: GTA III: Vice City, Dead Trigger, Sonic the Hedgehog 4 Episode II, Switch Galaxy and Max Payne. 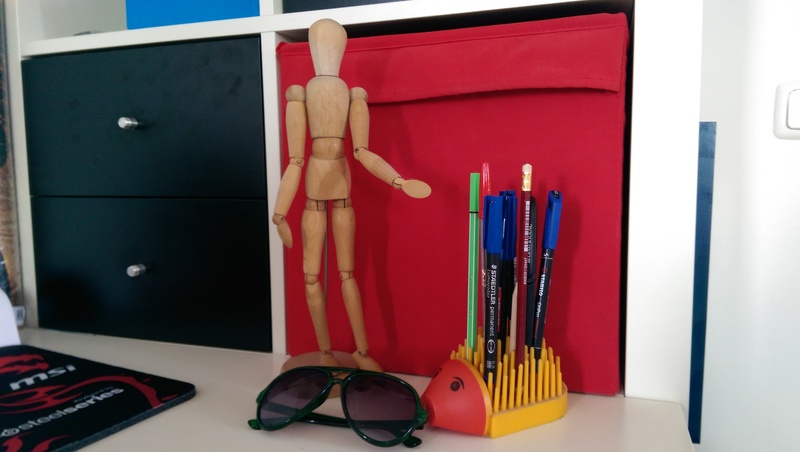 Another problem is the simultaneous holding of the controller and the smartphone, which means you will need a stand for the Xperia Z2 to enjoy the gaming experience. The Xperia Z1 was a real hothead that could become rather warm. Not to the extent that it would be uncomfortable to hold in the hand, but the warming was perceptible under maximum load. That was certainly not perfect for the durability of the components. 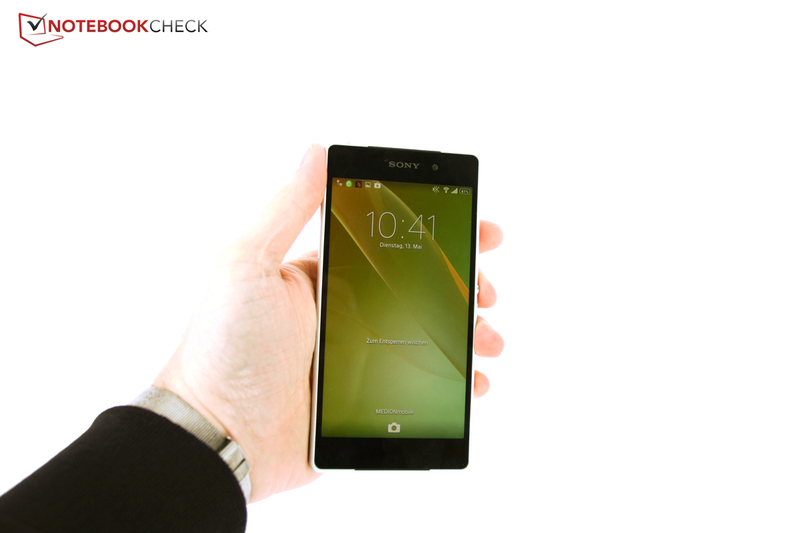 The Xperia Z2 has a more efficient SoC and should stay cooler. 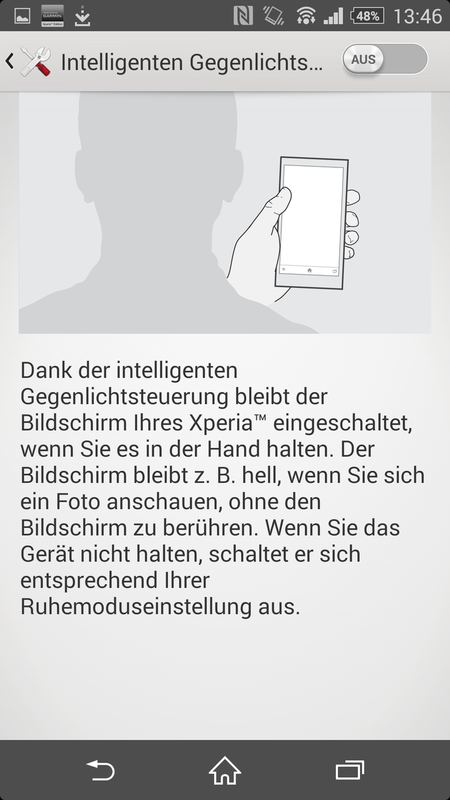 The successor actually manages that, during idle in particular: While the temperatures of the Xperia Z1 reached around 33 °C (91.4 °F) on the whole front, the Xperia Z2 only warms up to 32 °C (89.6 °F) at some spots and stays below 30 °C (86 °F) otherwise. The overall temperatures also dropped by around 2 °C (~3.6 °F) under load. 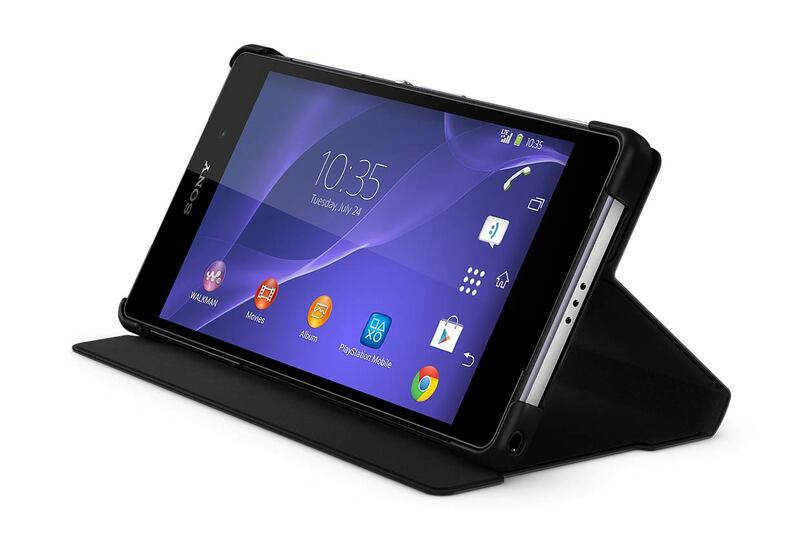 However, compared to the HTC One M8, the Galaxy S5 or the iPhone 5s, the Xperia Z2 is still the warmest device. It is never uncomfortable for the user, but obviously for the components: The camera is deactivated after five minutes 4K recording due to safety reasons. It is only fair to say that Samsung also included this safety threshold. 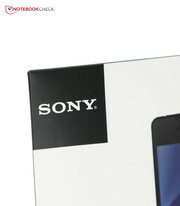 The speakers of the Sony are now directed towards the user as well. 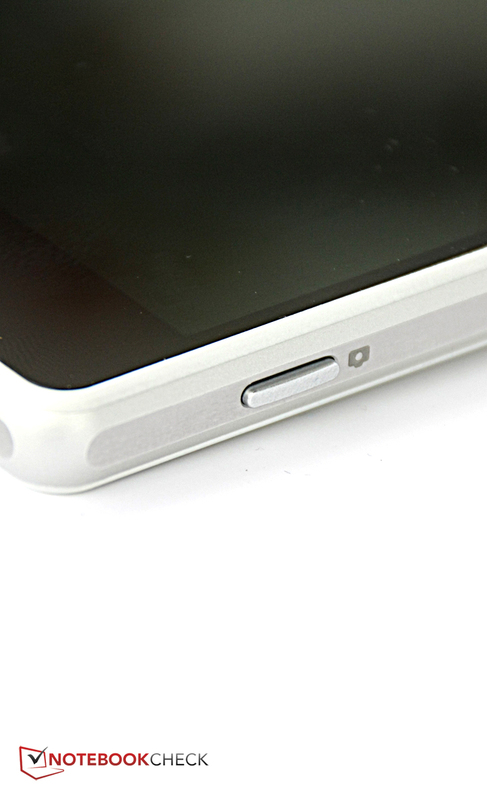 This trick was copied from the HTC One M7 and M8: Two horizontal openings in the case cover the speakers at the top and the bottom end of the smartphone. However, the speakers cannot compete with the clever sound design of the HTC One M8. First of all, the sound is not as rich compared to HTC’s high-end smartphone. This might be caused by the much smaller volume that Sony can use for its speakers inside a familiar case. HTC designed its chassis with the speakers in mind. The second thing is that the speakers are sufficiently loud, but the different frequencies easily overlap and the sound becomes blurred instead of differentiated. The sound is focused on the medium tones, but also occasionally muffled as a result. Bass is very limited. We like the accessories like the cover with the stand and the docking station, which holds the Xperia Z2 in landscape mode that improves the stereo effect. 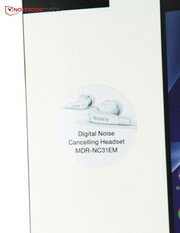 Another highlight is the provided headset with noise canceling that reduces ambient noise during calls or music playback. 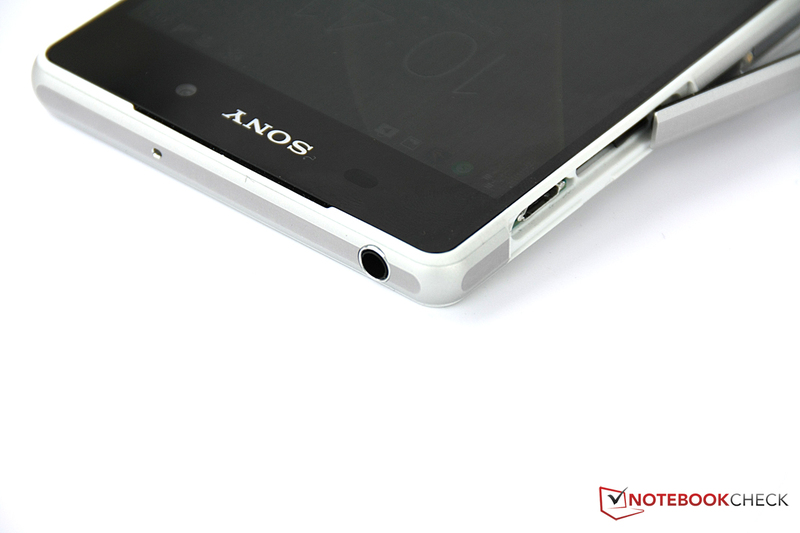 The Xperia Z2 also has a five-pin stereo jack, which means you can use high-quality headphones with all features. 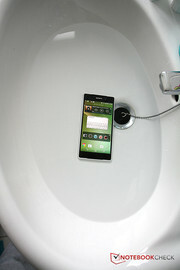 The predecessor Xperia Z1 was not very frugal in regard to the power consumption. The values have hardly changed with the successor; the larger display obviously compensates the more efficient SoC. The average consumption while idling is identical to the predecessor’s 1.6 Watts and significantly higher than the Samsung Galaxy S5 or the iPhone 5s. The consumption is closer to the rivals under load: 3.4 up to 5.1 Watts are consumed by the Xperia Z2 under load, nearly identical to the Galaxy S5 and the HTC One M8. The consumption did not change, but at least the battery is now bigger: 3,200 mAh are provided by the battery of the Xperia Z2 compared to 3,000 mAh of the Xperia Z1. Our review unit has a total capacity of 11.84 Wh. The WLAN test, which is the most practical scenario, only results in 10:23 hours for the Xperia Z2, the predecessor managed 12:50 hours. Compared to the big rivals HTC One M8 and Galaxy S5, the results of the Xperia Z2 are average: The great stand-by times of the Galaxy S5 are not reached by the smartphone, but the WLAN runtime is comparable to Samsung’s current flagship and the HTC One M8 is clearly beaten. We usually managed a full day of normal use in practice with the Xperia Z2, and the smartphone lasted 2-3 days in stand-by. You should use the supplied power adaptor; it provides 1.5 amps and charges the battery in little more than two hours. Power adaptors of other smartphones often provide less amps and need much longer to charge the large batteries. After only seven months a new model appears, can there be any big changes? Sony actually managed to (slightly) improve on the Xperia Z1 in some critical areas: The Z2 panel is significantly better compared to the Xperia Z1, but still not quite as good as the AMOLED display of the Samsung Galaxy S5. The software looks classy, was enhanced even further, and Sony also includes free content from the company’s portfolio to improve the sales figures: Free movies, Michael Jackson album, high-quality headset. We still have the feeling that the synergy effects have not been exhausted completely, especially in terms of gaming and PlayStation. 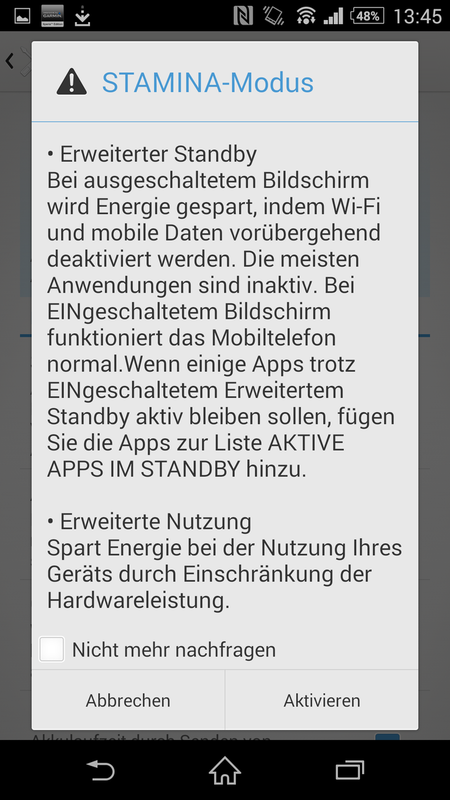 The battery capacity has been increased, but the runtimes are not automatically better. The Xperia Z2 can at least clearly beat the HTC One M8. 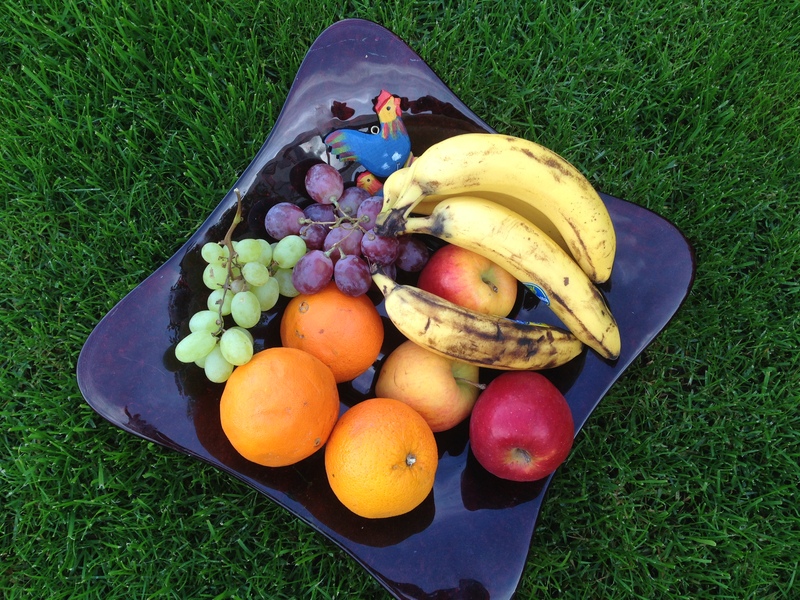 The camera was only improved in regard to the software. It is still one of the best smartphone cameras you can currently get. You can take pictures in the pool as well since the smartphone is waterproof and dust resistant. You should hold the smartphone before you buy it to see if you like the boxy case and the smooth back cover. Unfortunately, the build quality is not perfect; HTC and Samsung are superior. 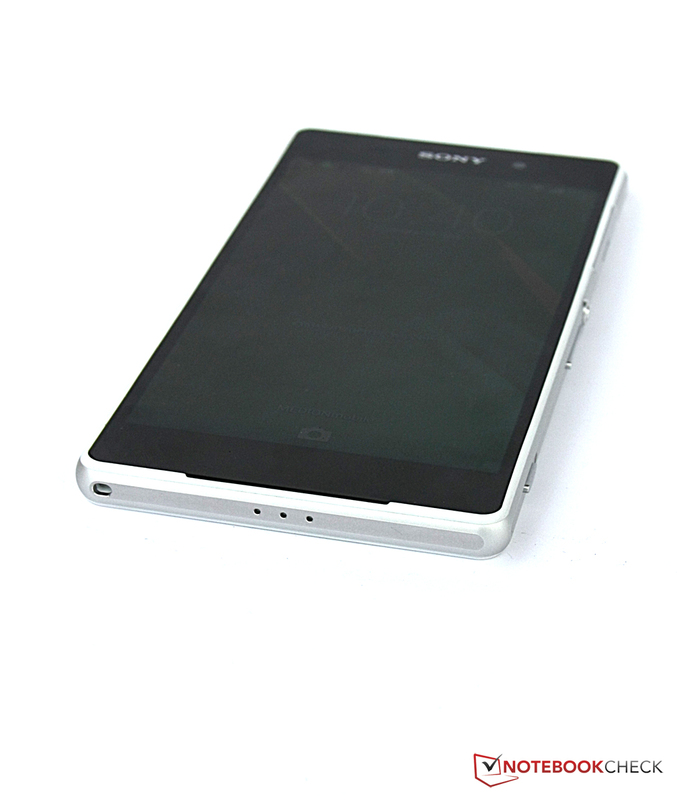 If you like this special Sony design touch, you will get a great smartphone with the Xperia Z2. The Japanese always manage to give their products a certain luxurious touch. We can fully recommend the device, even though there are small drawbacks in terms of the case and the panel. We give the Xperia Z2 an additional point for the great headset and the good software included. You do not have to get to the store if you already have an Xperia Z1 – the Xperia Z2 is not a huge improvement. It is more like a good development in many areas, which can be an indicator for the upcoming Xperia Z3 (sturdier case, good speakers at the front, better panel). At least we hope it is; it would be the next step towards a perfect smartphone. In Review: Sony Xperia Z2. 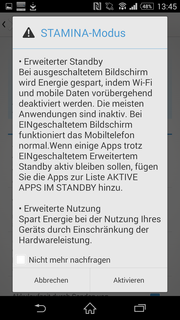 Review unit courtesy of Sony Mobile Germany. 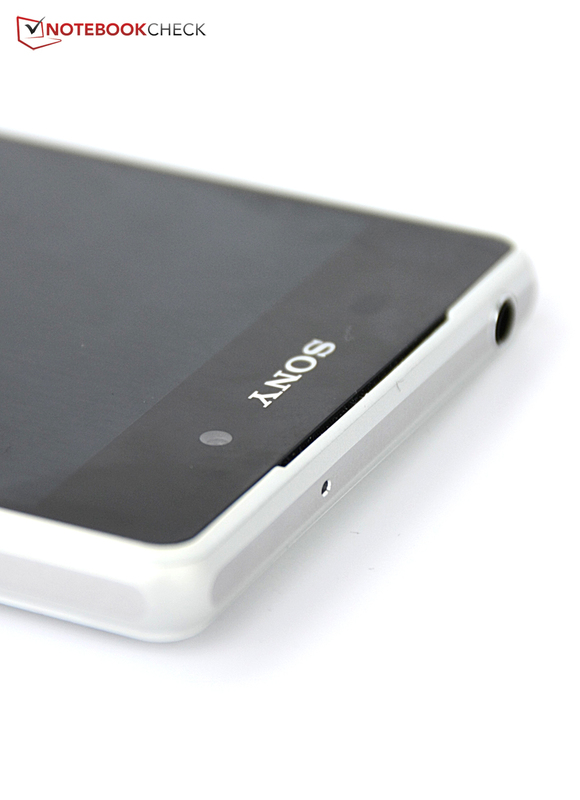 It just took seven months before the Xperia Z1 got a successor: the Xperia Z2. Sony tried to improve some issues of the predecessor. 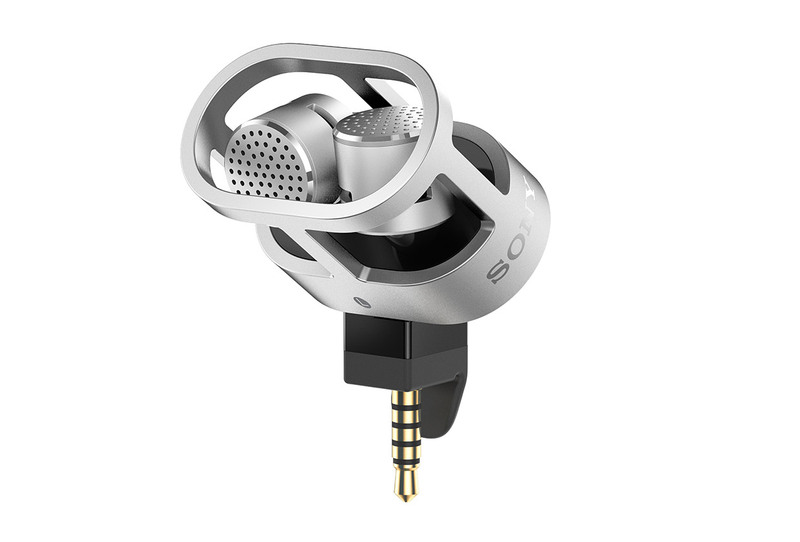 There are also gimmicks like a noise cancelling headset, which retails for 59 Euros. The 5.2-inch Xperia Z2 is slightly bigger than the Galaxy S5 and the HTC One M8. The smartphone uses several Sony technologies. The display is not as bright anymore, but the viewing angles are now better compared to the predecessor. Nothing changed in regard to the camera hardware. 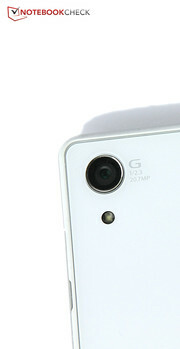 However, that is not really necessary: The 20.7 MP lens is one of the best smartphone cameras on the market. The back is once again made of mineral glass and looks very impressive. A camera button helps taking pictures. The choice of materials also results in a pretty slippery smartphone that attracts fingerprints. The rest of the case is made of metal. The build quality is good, but the stability is not always perfect. 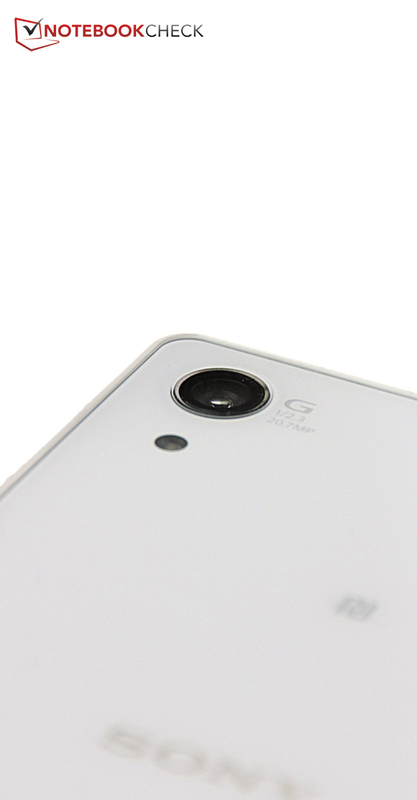 A 2.2 MP camera is at the front and is more than sufficient for video calls and selfies. Openings for the microphone are at the bottom. The speakers are now directed towards the user. The case now has two horizontal openings. Because of the boxy shape, the haptics cannot keep up with HTC One M8 or the Samsung Galaxy S5. It is waterproof and dust resistant, despite the numerous openings. Taking pictures and making calls in fresh water is possible for up to 30 minutes. If the openings are covered, the smartphone can get wet without any issues. 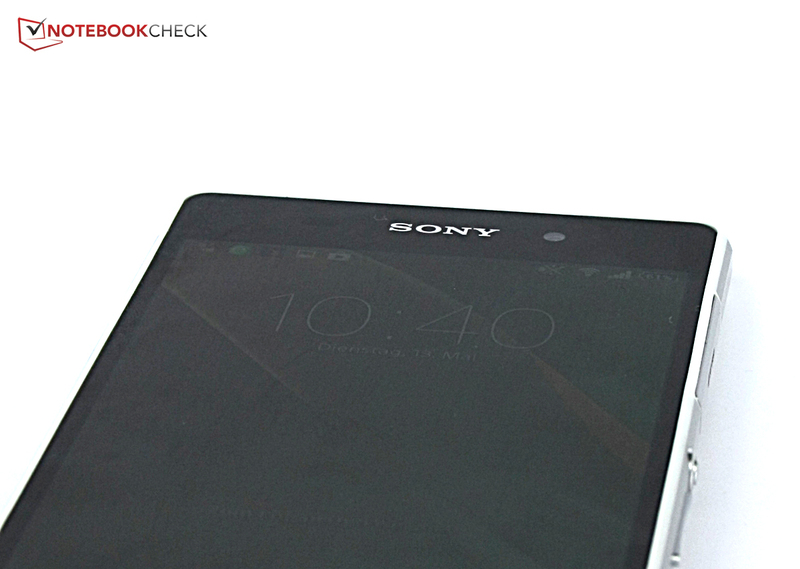 However, the Xperia Z2 is no outdoor smartphone, the glass surfaces are too fragile for that. The design of the power button is typical for Sony. Behind the covers are the micro USB port, SIM slot and (not in the picture) the micro SD slot. The headset port at the top is very high quality, because it supports five-pin jacks that enable additional features. Slightly lighter and hardly bigger: The case did not really change compared to the predecessor. 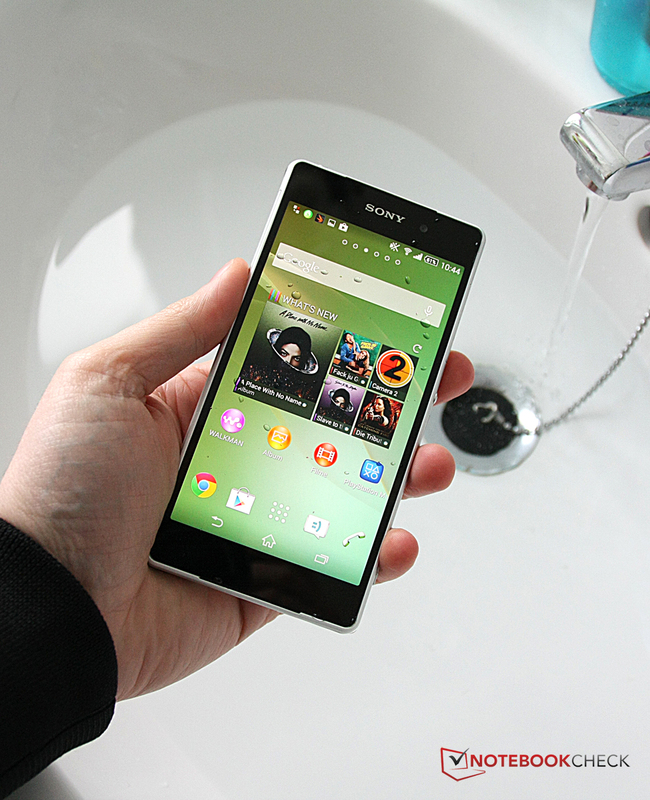 The Xperia Z2 is a stylish smartphone with a great camera. The panel is also pretty good this time, but cannot quite keep up with the AMOLED display of the Galaxy S5. Some things can still be improved, but you get an excellent smartphone if you like the design and take a lot of pictures. All picture effects can quickly be accessed via a widget. This widget can also be customized. There is a nice glimmer effect when you unlock the device. Sony's apps can be updated via Update Center. 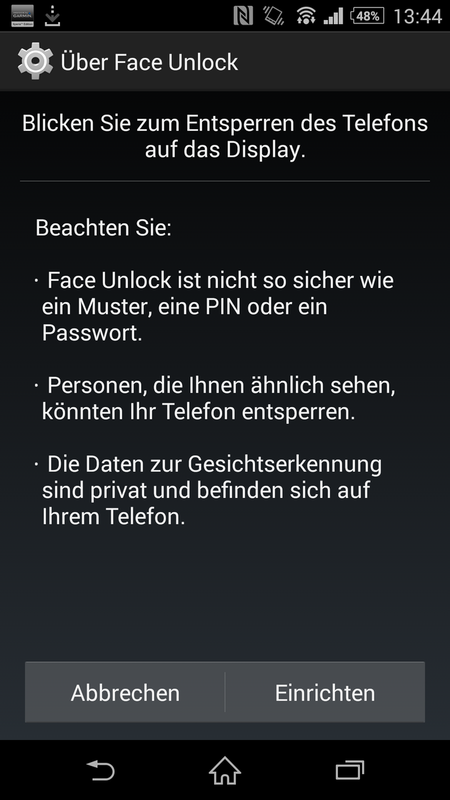 The smartphone can be unlocked via facial recognition. The storage can be encrypted. You can activate the STAMINA mode to increase the battery runtime, but it is not as radical as its counterparts from Samsung or HTC. The smartphone uses a light sensor to stay active as long as you hold it. 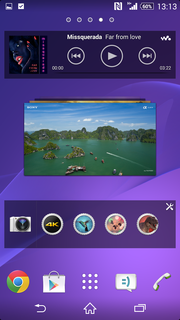 Sony equips the smartphone with a simple home screen. 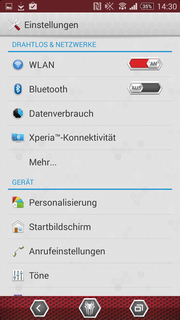 You can change the look via Xperia Designs. One theme is Film Noir. 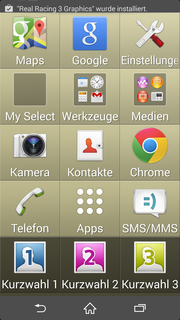 The designs also change the icons and controls. Sony includes several free contents, for example the new Michael Jackson album. Sony could improve the temperature control. 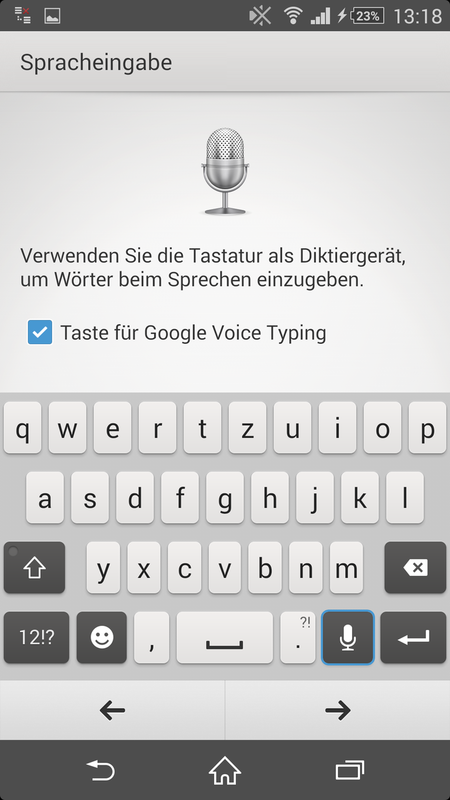 The keyboard can be adjusted with an assistant. ... but the corresponding button can also be hidden. That Sony improved the predecessor. Some developments are just compromises, for example the speakers. That Sony cannot use the potential of its strong PlayStation brand in terms of mobile gaming.